As this is a turning point in the life of a minister who was hereafter to exercise so important an influence on the reign, I stay for a moment to review his past career. 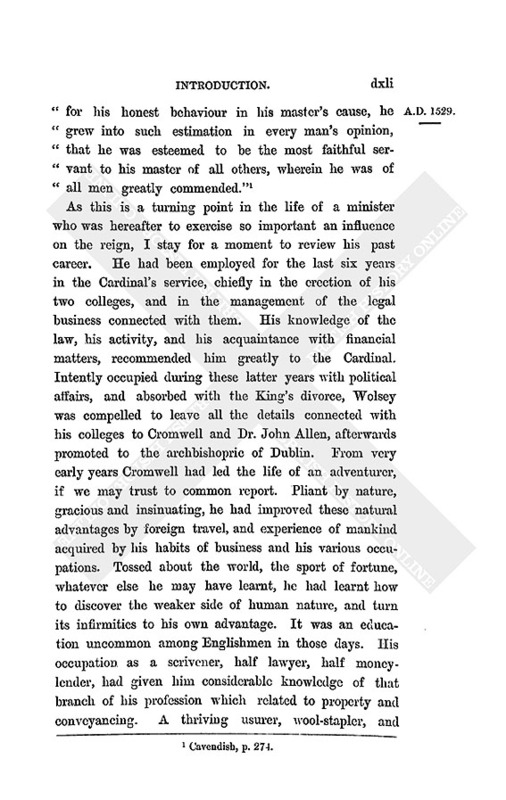 He had been employed for the last six years in the Cardinal's service, chiefly in the erection of his two colleges, and in the management of the legal business connected with them. His knowledge of the law, his activity, and his acquaintance with financial matters, recommended him greatly to the Cardinal. Intently occupied during these latter years with political affairs, and absorbed with the King's divorce, Wolsey was compelled to leave all the details connected with his colleges to Cromwell and Dr. John Allen, afterwards promoted to the archbishopric of Dublin. From very early years Cromwell had led the life of an adventurer, if we may trust to common report. Pliant by nature, gracious and insinuating, he had improved these natural advantages by foreign travel, and experience of mankind acquired by his habits of business and his various occupations. Tossed about the world, the sport of fortune, whatever else he may have learnt, he had learnt how to discover the weaker side of human nature, and turn its infirmities to his own advantage. It was an education uncommon among Englishmen in those days. His occupation as a scrivener, half lawyer, half moneylender, had given him considerable knowledge of that branch of his profession which related to property and conveyancing. 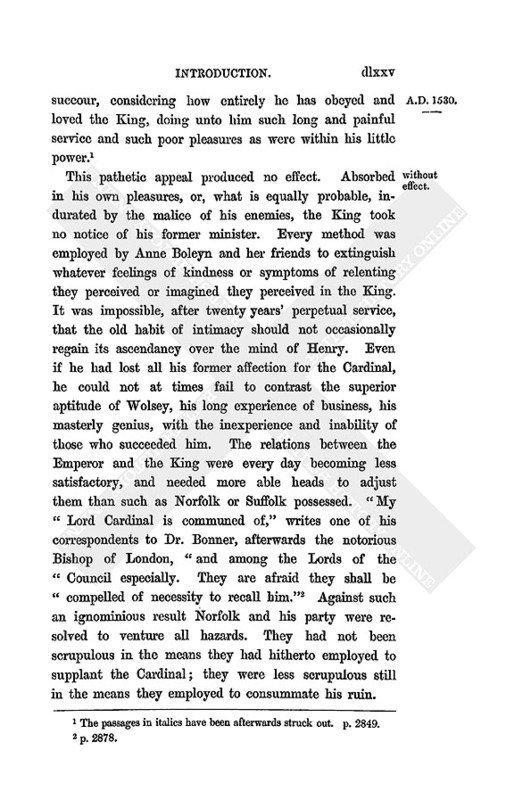 A thriving usurer, wool-stapler, and merchant, with a small capital painfully accumulated, he had by various loans obliged the needy scions of nobility and the poorer gentry, who, in the extravagant days of Henry VIII., often found themselves in difficulties, and were glad of his assistance at any cost. In the civil wars of the last century a great part of the nobility had been cut off. Those who remained, and had contrived to preserve their estates, were restrained by the policy of the Tudors from regaining their influence. Many were deeply in debt to the Crown; many, during the reign of Henry VII. and his successor, had incurred heavy penalties. If the reader will turn to the list of recognisances in this and the previous volumes, he will see how large a portion of the nobility and gentry were hopelessly plunged in debt; how many names were inscribed in the royal ledgers of Henry VII. and Henry VIII. for large sums, which the Crown had no hope of recovering. 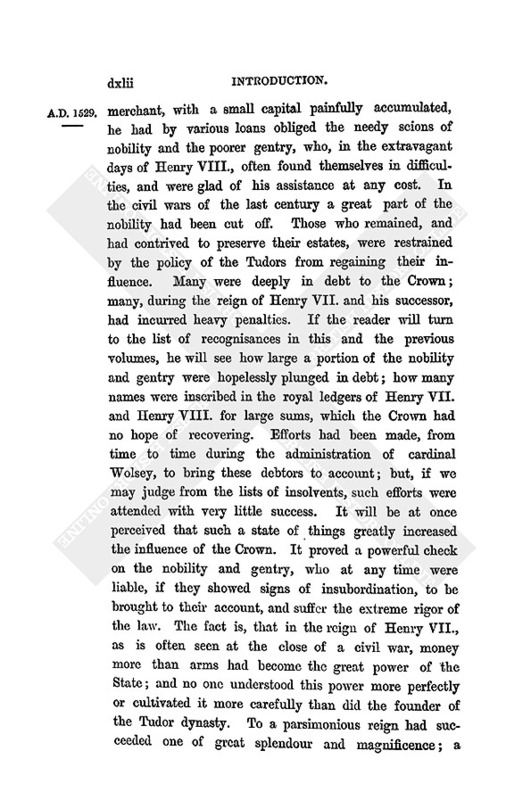 Efforts had been made, from time to time during the administration of cardinal Wolsey, to bring these debtors to account; but, if we may judge from the lists of insolvents, such efforts were attended with very little success. It will be at once perceived that such a state of things greatly increased the influence of the Crown. It proved a powerful check on the nobility and gentry, who at any time were liable, if they showed signs of insubordination, to be brought to their account, and suffer the extreme rigor of the law. The fact is, that in the reign of Henry VII., as is often seen at the close of a civil war, money more than arms had become the great power of the State; and no one understood this power more perfectly or cultivated it more carefully than did the founder of the Tudor dynasty. To a parsimonious reign had succeeded one of great splendour and magnificence; a Court of gay, ambitious, brilliant young courtiers, to a grave and sombre court of ecclesiastics, brought up in the older school of frugality and discipline. In the costly revels and entertainments which distinguished the early years of Henry VIII. no one could take part unless he was prepared to lavish on his dress, his armour, and his masking habits, the same reckless expenditure as that of which the King and those around him set the example. Lands were pawned, estates were wasted, in providing the richest arms of the latest fashion, the most dazzling jewels and fantastic disguises, without which no young man of any pretensions could hope to distinguish himself from the throng, or take part in these courtly amusements. Nor was serious war, if serious it could be called, less ruinous in this respect than were these pastimes. To needy men whose incomes had not advanced in proportion to their wants, even small sums of ready money, and inferior employments under the Crown, small fees and offices in the gift of lay patrons and guardians of religious houses, were an object of solicitude. 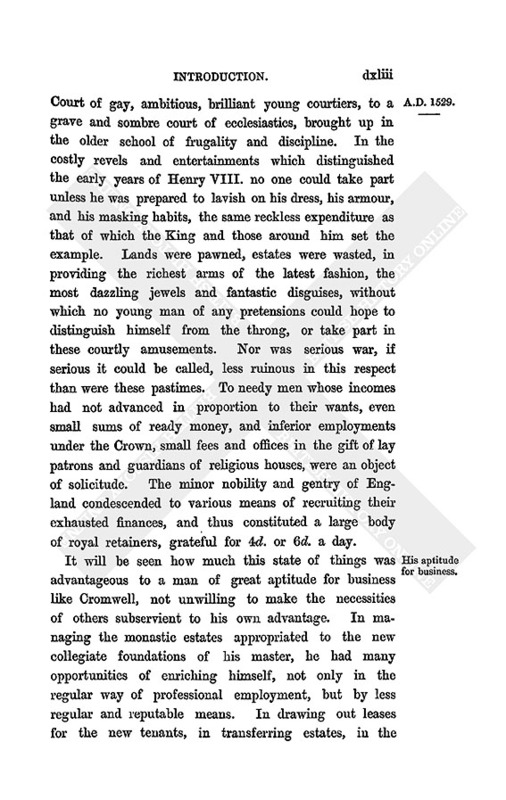 The minor nobility and gentry of England condescended to various means of recruiting their exhausted finances, and thus constituted a large body of royal retainers, grateful for 4d. or 6d. a day. It will be seen how much this state of things was advantageous to a man of great aptitude for business like Cromwell, not unwilling to make the necessities of others subservient to his own advantage. In managing the monastic estates appropriated to the new collegiate foundations of his master, he had many opportunities of enriching himself, not only in the regular way of professional employment, but by less regular and reputable means. 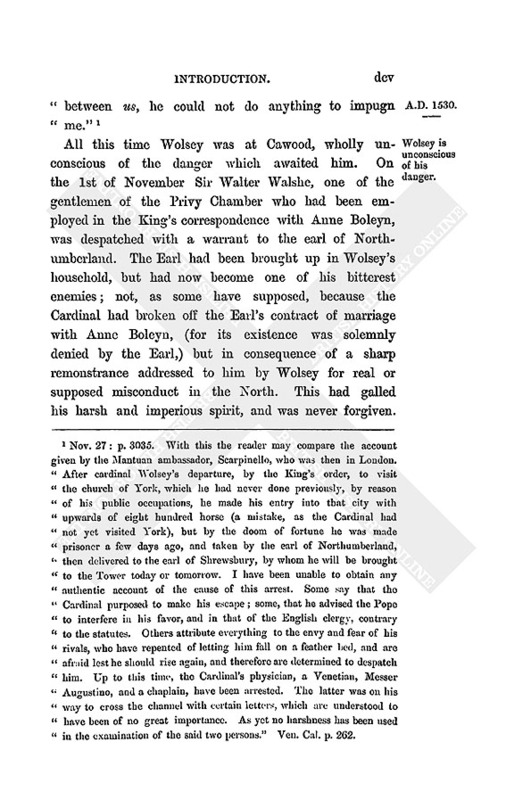 In drawing out leases for the new tenants, in transferring estates, in the expences really or ostensibly incurred on such occasions, he was able to secure ample remuneration from a master who was far too deeply engrossed in the business of the State to scrutinise very narrowly the proceedings of his subordinates. But there were other means less justifiable of enriching himself, in which Cromwell did not scruple to indulge, which more than once brought great odium upon himself, and even upon the Cardinal. 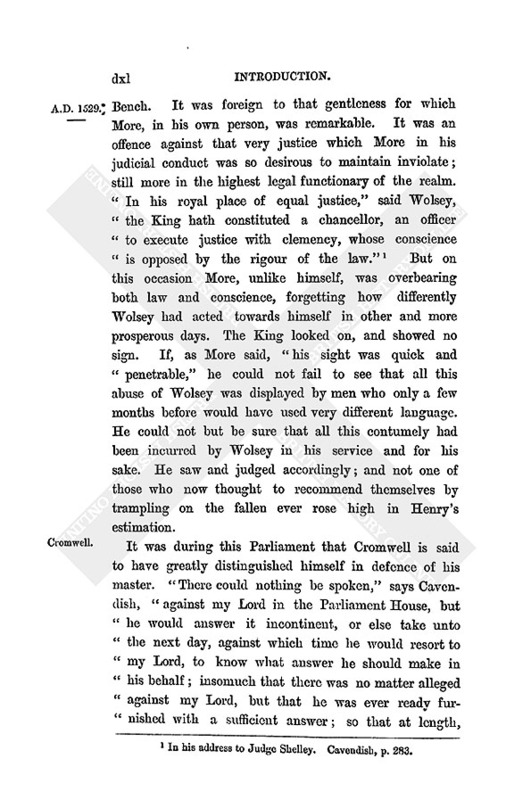 Loud outcries reached the King's ears of the exactions and peculations of Wolsey's officers, in which the name of Cromwell was most frequently repeated; and more than once the King had to express his grave displeasure at the conduct of a man who was soon after destined to occupy the highest place in his favor. 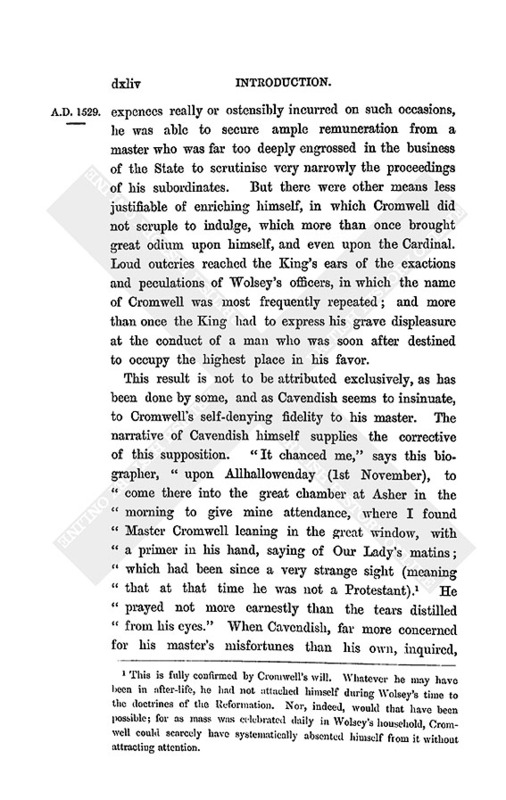 This result is not to be attributed exclusively, as has been done by some, and as Cavendish seems to insinuate, to Cromwell's self-denying fidelity to his master. The narrative of Cavendish himself supplies the corrective of this supposition. "It chanced me," says this biographer, "upon Allhallowenday (1st November), to come there into the great chamber at Asher in the morning to give mine attendance, where I found Master Cromwell leaning in the great window, with a primer in his hand, saying of Our Lady's matins; which had been since a very strange sight (meaning that at that time he was not a Protestant). (fn. 2) He prayed not more earnestly than the tears distilled from his eyes." When Cavendish, far more concerned for his master's misfortunes than his own, inquired, "Is my Lord in any danger, for whom you lament thus?" 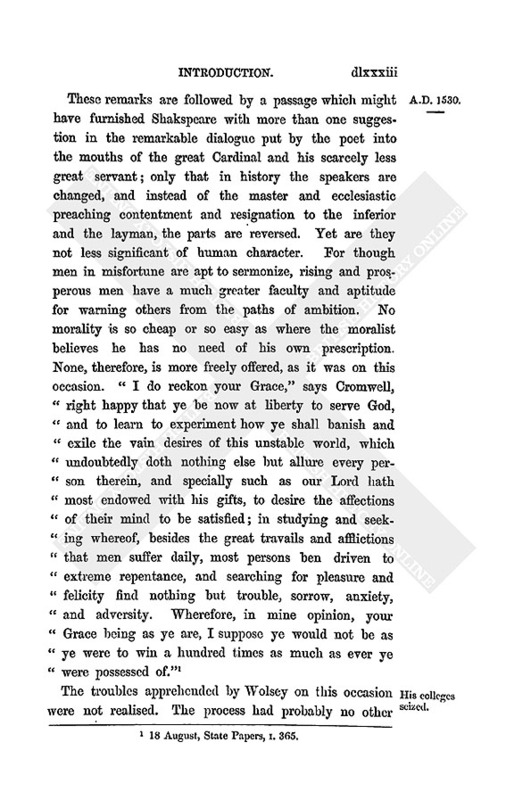 the reply of Cromwell is significant of his character. His tears were not flowing for Wolsey, but for himself. "It is my unhappy adventure," he replied, "that I am like to lose all I have travailed for all the days of my life, for doing of my master true and diligent service." And on Cavendish expressing a hope that he had done nothing in Wolsey's service that would bring him into danger, Cromwell answered, "I understand right well that I am in disdain with most men for my master's sake, and surely without just cause." He then expressed his resolution after dinner of riding to the Court, and, in his own language, "to make or mar" (fn. 3) before he returned again to Esher. How he succeeded, and with what great rapidity he rose, we learn by a better authority than Cavendish. For Vaughan tells him from the Low Countries, on the 3rd February, that he had received Cromwell's letters a few days ago, and was glad to learn how well he was progressing. "You now sail," he says, "in a sure haven;" meaning that Cromwell had escaped the dangers to which his old master was still exposed, and had obtained the favour at Court which he sought for. He adds as a caution, "a merry semblance of weather often thrusteth men into the dangerous seas, not thinking to be suddenly oppressed with tempest, when unawares they be prevented and brought in great jeopardy." 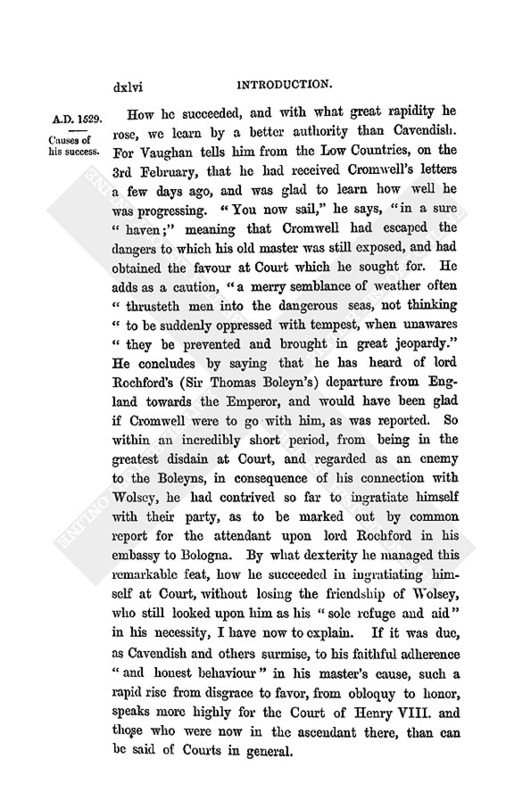 He concludes by saying that he has heard of lord Rochford's (Sir Thomas Boleyn's) departure from England towards the Emperor, and would have been glad if Cromwell were to go with him, as was reported. 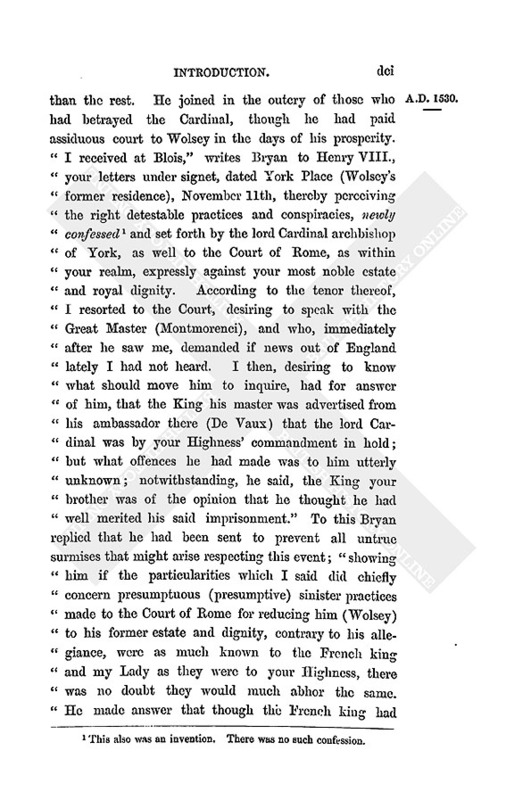 So within an incredibly short period, from being in the greatest disdain at Court, and regarded as an enemy to the Boleyns, in consequence of his connection with Wolsey, he had contrived so far to ingratiate himself with their party, as to be marked out by common report for the attendant upon lord Rochford in his embassy to Bologna. By what dexterity he managed this remarkable feat, how he succeeded in ingratiating himself at Court, without losing the friendship of Wolsey, who still looked upon him as his "sole refuge and aid" in his necessity, I have now to explain. If it was due, as Cavendish and others surmise, to his faithful adherence "and honest behaviour" in his master's cause, such a rapid rise from disgrace to favor, from obloquy to honor, speaks more highly for the Court of Henry VIII. and those who were now in the ascendant there, than can be said of Courts in general. His mode of operation was simple enough, and he seldom departed from it. Clever, facile, if not unprincipled, yet troubled by no stern dogmatic faith or unbending integrity, his experience in the suppression of monastic houses had given him no exalted idea of the sanctity of churchmen, and still less of church property. "Our abbeys and our priories shall pay," an unreal boast in the mouth of King John, was by no means an unreality to Cromwell. He had found it successful already. He was destined, under more favorable circumstances, to give it a wider application. His accession to power marks a great change in the policy of Henry VIII. which was regarded by many with little satisfaction. But at present it was his first concern to obtain some provision for those attendants who still remained faithful to Wolsey; and his mode of proceeding on this occasion furnishes a striking exemplification of his character, and of the policy adopted by him under a more powerful master. The veracity of Cavendish, to whom we are indebted for the anecdote, cannot be doubted. The surrender by the Cardinal of all his goods and chattels upon his indictment in the Præmunire, and the sentence passed upon him in the King's Bench, by which he forfeited all his possessions to the Crown, left him wholly unprovided. 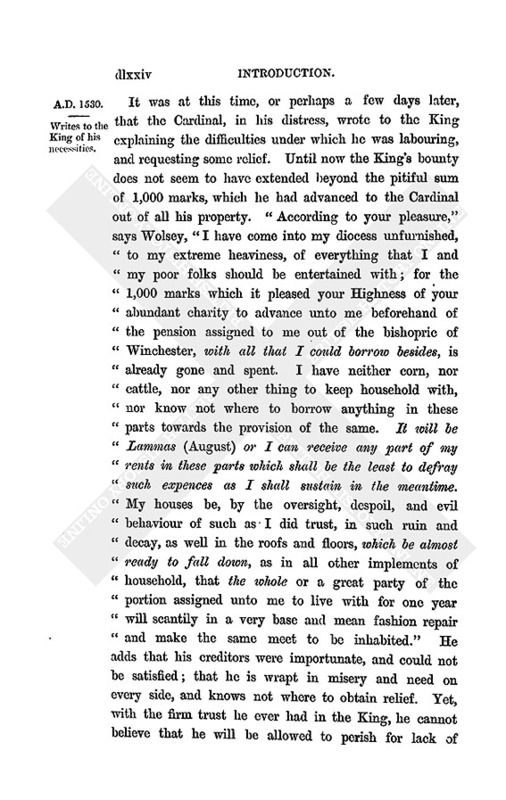 Either from carelessness, indignation, or a persuasion that he was possessed of certain hidden riches, the King had made no provision for him of any kind; and in his retirement at Esher, the Cardinal and his household continued for the space of three or four weeks without "beds, sheets, tablecloths, cups and dishes, to eat, or to lie in." 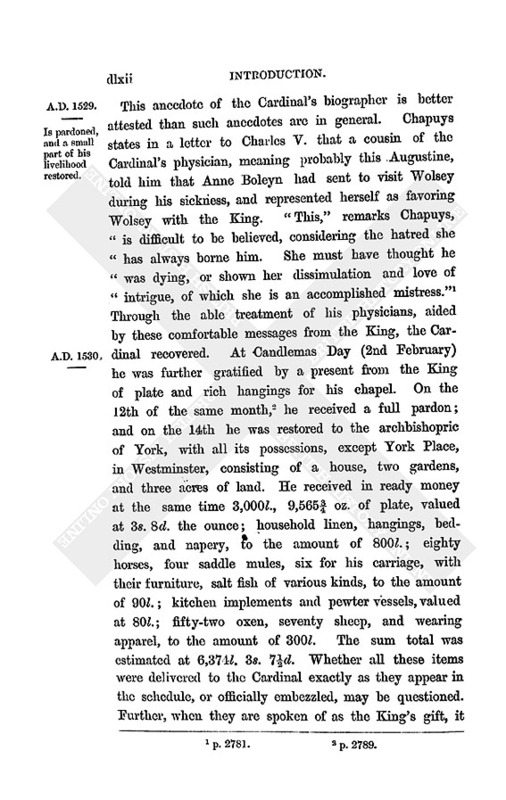 Of the bishop of Carlisle and Sir Thomas Arundel he was compelled to borrow plate and linen, and whatever else was required for his commonest personal necessities. To procure the wages due to his attendants was out of his power. To dismiss them at a moment's warning, and send them home to their wives and families in the country without their wages or hope of future advancement, was too painful for Wolsey to contemplate. In this dilemma he was advised by Cromwell to call them together, and address a few words to them on his present necessity. To a lofty and generous spirit such an act as this was doubly distasteful, from the contrast which it offered of his present misery to his former affluence and greatness when he had the means of rewarding their fidelity. And so it was felt to be by Wolsey, the most liberal and magnificent of masters. "Nothing hath no savour," he said in desponding tones, "and I do lament the want of substance to distribute amongst them." "Why, Sir," added Cromwell, "have you not a number of chaplains on whom ye have bestowed very liberally spiritual promotions? There is not one of the least who by your preferment cannot spend three hundred marks a year, whilst your yeomen and gentlemen, who have done much more for you, have received no advantage. If they will not frankly consider your liberality, and assist you in your present necessity, it is a pity they should be allowed to live." 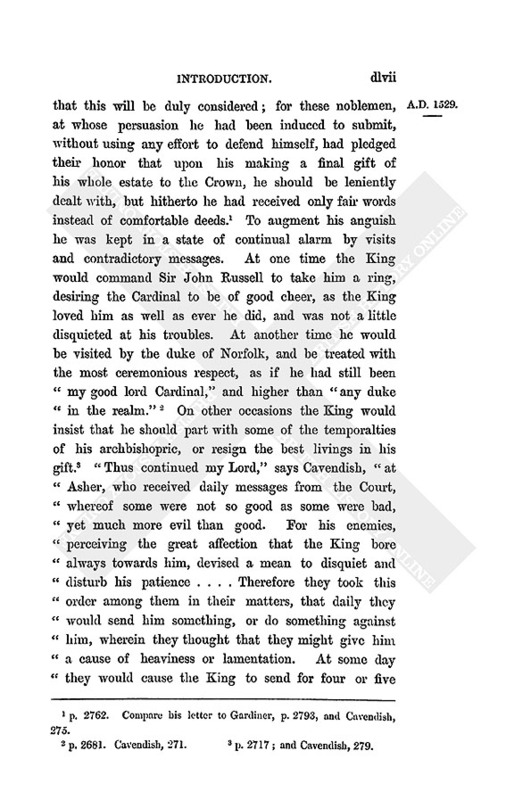 As no other alternative presented itself, the Cardinal, more than ever deferential to his ready-witted adviser, consented; and, assembling his attendants, he explained to them his inability to requite them for their services, expressing his hope that better times would come, when the King would relent, and he should be able to reward them. He begged them in the meantime to take their pleasures for a month, and "at the end of the period he would use his influence in procuring them admission into the King's service, or elsewhere, wherever his interest extended." "But, Sir," said Cromwell, "there are divers of your yeomen would be glad to see their friends; but they lack money, and here are divers of your chaplains who have received great benefits from you; let them now show their humanity. Though for my part I have not received a penny from you towards the increase of my yearly (fn. 6) living, yet I am willing to part with this towards the expences of your servants;" and therewith delivered the Cardinal 5l. in gold. "Now," added he, "let us see what your chaplains will do, who are much more able to give a pound than I am able to spend a penny." The suddenness of the appeal, the presence of all the household who were assembled upon the occasion, the grief and necessity of the Cardinal himself, who was entirely overcome by the violence of his emotions, produced the necessary effect. His chaplains among them offered sums of such amount as enabled Wolsey to pay all the wages of his household, and advance them money for their journey. It was on the same principle that he proceeded to secure for himself, and for his master, friends at Court, and take off the animosity of his enemies. Accustomed to deal with men in the mass, and in great political combinations, no one understood men individually less than the Cardinal. The idea of propitiating the malice of his enemies by gifts or pensions out of his bishopric never seems to have entered his head. Even when the King, whose favor it was most important for him to propitiate, was anxious to have the Cardinal's house at Westminster, intending to turn it into a palace, Wolsey was little inclined to surrender possession, although the Judges had declared their opinion that the right of it rested in the King. (fn. 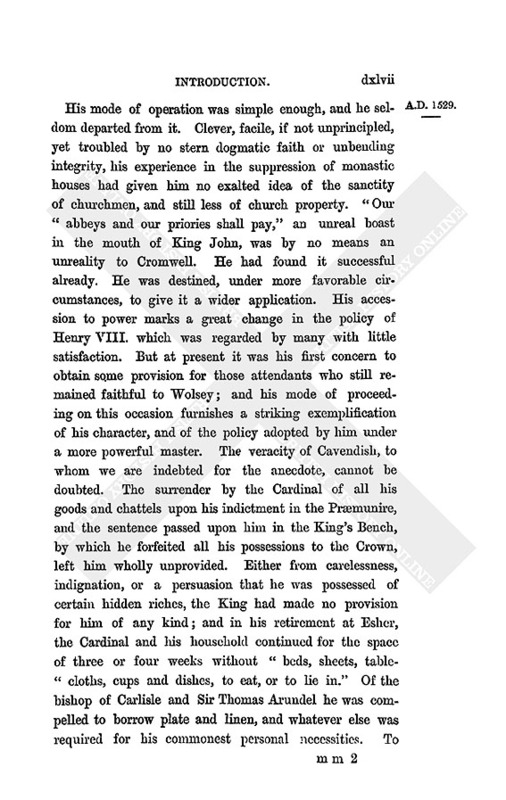 7) Now, however, unable to stand up in his own defence, and surrendering himself entirely to the adroit management of his adviser, who, in promoting the interest of the Cardinal, was also promoting his own, we find him adopting Cromwell's policy. To George Boleyn, Anne Boleyn's brother, he granted an annuity of 200l. out of the revenues of Winchester, and 200 marks out of the lands of St. Alban's. (fn. 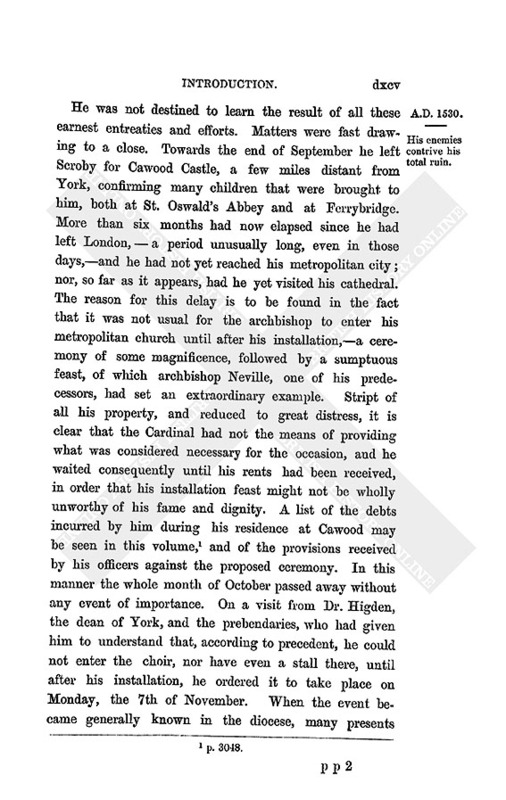 8) For Sir Henry Norris, another favorite, he made an increase of his fee to 100l. To Lord Sands, the comptroller of the Household, 40l. To Sir John Russell, 20l. He would like the last, he says, to be 40l. or 50l. ; and will do this with all his heart, and more, if Cromwell thinks it expedient. Shortly after he writes to Cromwell to say, that he has always loved Norris for the service he has done to the King, and is willing to increase his fee to 200l., and will enlarge the fee of Fitzwilliam, the King's treasurer. Similar gifts, judiciously bestowed, at Cromwell's advice and suggestion, though they did not suffice to restore him to favor, had the effect, for the time, of softening the bitterness of his enemies. The Bill, or the "Book of Articles," (fn. 16) as Hall calls them, "which the Lords had put to the King against the Cardinal," and passed on the 1st of December, was sent down to the Commons. Whether it provoked any discussion is uncertain. 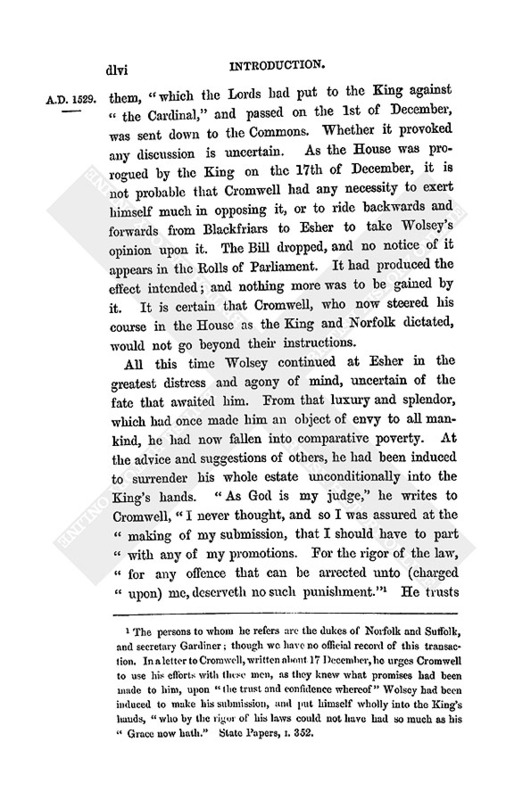 As the House was prorogued by the King on the 17th of December, it is not probable that Cromwell had any necessity to exert himself much in opposing it, or to ride backwards and forwards from Blackfriars to Esher to take Wolsey's opinion upon it. The Bill dropped, and no notice of it appears in the Rolls of Parliament. It had produced the effect intended; and nothing more was to be gained by it. It is certain that Cromwell, who now steered his course in the House as the King and Norfolk dictated, would not go beyond their instructions. Is pardoned, and a small part of his livelihood restored. This anecdote of the Cardinal's biographer is better attested than such anecdotes are in general. Chapuys states in a letter to Charles V. that a cousin of the Cardinal's physician, meaning probably this Augustine, told him that Anne Boleyn had sent to visit Wolsey during his sickness, and represented herself as favoring Wolsey with the King. "This," remarks Chapuys, is difficult to be believed, considering the hatred she has always borne him. She must have thought he was dying, or shown her dissimulation and love of intrigue, of which she is an accomplished mistress." (fn. 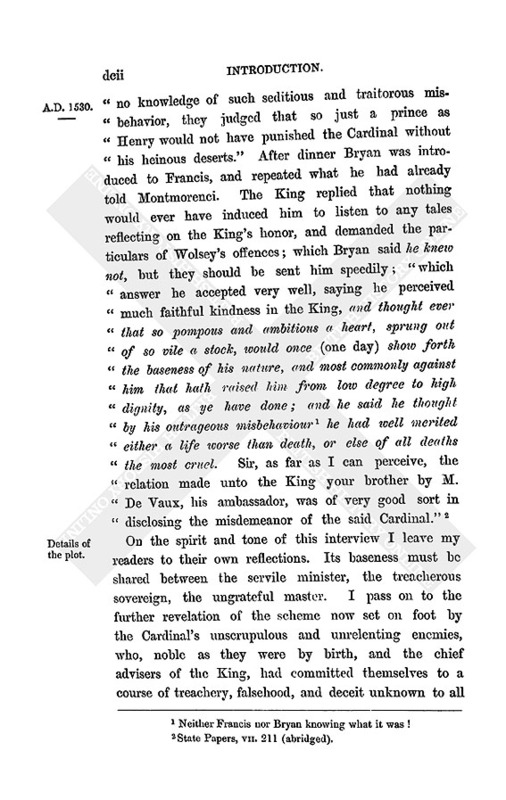 28) Through the able treatment of his physicians, aided by these comfortable messages from the King, the Cardinal recovered. At Candlemas Day (2nd February) he was further gratified by a present from the King of plate and rich hangings for his chapel. On the 12th of the same month, (fn. 29) he received a full pardon; and on the 14th he was restored to the archbishopric of York, with all its possessions, except York Place, in Westminster, consisting of a house, two gardens, and three acres of land. He received in ready money at the same time 3,000l., 9,565¾ oz. of plate, valued at 3s. 8d. the ounce; household linen, hangings, bedding, and napery, to the amount of 800l. ; eighty horses, four saddle mules, six for his carriage, with their furniture, salt fish of various kinds, to the amount of 90l. ; kitchen implements and pewter vessels, valued at 80l. ; fifty-two oxen, seventy sheep, and wearing apparel, to the amount of 300l. The sum total was estimated at 6,374l. 3s. 7½d. Whether all these items were delivered to the Cardinal exactly as they appear in the schedule, or officially embezzled, may be questioned. 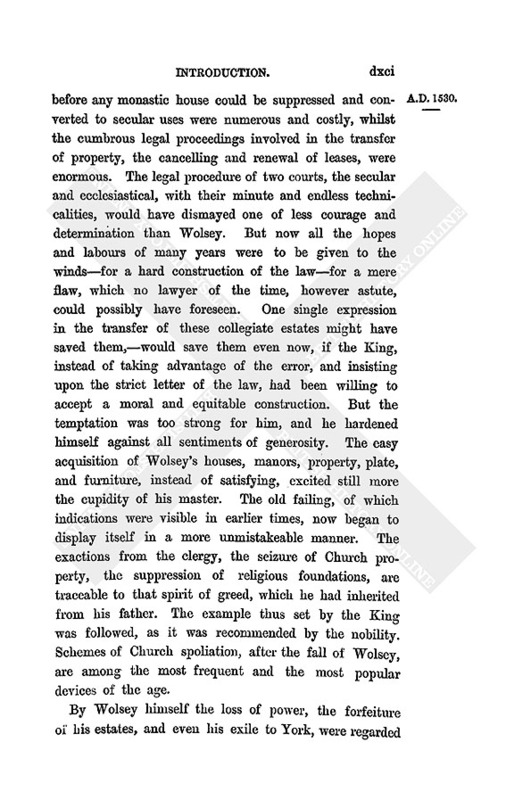 Further, when they are spoken of as the King's gift, it must be remembered that they were a gift in no other sense than as they were a restoration of a small portion of the Cardinal's property, which he had surrendered at his fall to the King, on the promise, as he himself states, that in so doing he should be leniently dealt with. He had been anxious to retain his other promotions of Winchester and St. Alban's, and for some time he entertained hopes that his wish would be gratified. Finding it was the King's pleasure he should retain only the administration of York, reserving to himself five or six of his best benefices, he writes to Gardiner: "If it is the King's pleasure that I should leave Winchester and St. Alban's, I am bound to submit; but if he will reflect how little time I have to live, the decay of the archbishopric by the sum of 800 marks, and my long services, considering also that I am to lose Winchester and St. Alban's, which I do not deserve to have lost, and did not expect to lose at my submission, as I had done no offence to the King, I trust a convenient pension will be granted me." (fn. 30) He urges this again with additional earnestness upon Gardiner, who was either not very forward or not able to help him, insisting on his miserable condition and continued sickness, increased by the moist and corrupt air of Esher, and an attack of the dropsy, with loss of appetite and lack of sleep. "I cannot live," he says; "wherefore of necessity I must be removed to some other drier air and place where I may have commodity of physicians. Secondly, having but York, which is now decayed by 800l. by the year, I cannot tell how to live, and keep the poor number of folks which I now have, my houses there being decayed, and of everything meet for a household unprovided and unfurnished. I have none apparel (furniture) for my houses there, nor money to bring me thither, nor to live with, till the propice time of the year shall come to remove thither. These things considered, Mr. Secretary, must needs make me in agony and heaviness, mine age therewith and sickness considered. Alas! Mr. Secretary, ye, with other my Lords, showed me that I should otherwise have been furnished and seen unto. Ye know in your learning and conscience whether I should forfeit my spiritualities of Winchester or no. Alas! the qualities of mine offences considered, with the great punishment and loss of goods that I have sustained, ought to move pitiful hearts." (fn. 31) But apparently pitiful hearts were few. His promotions taken from him. The King greedy for his wealth. 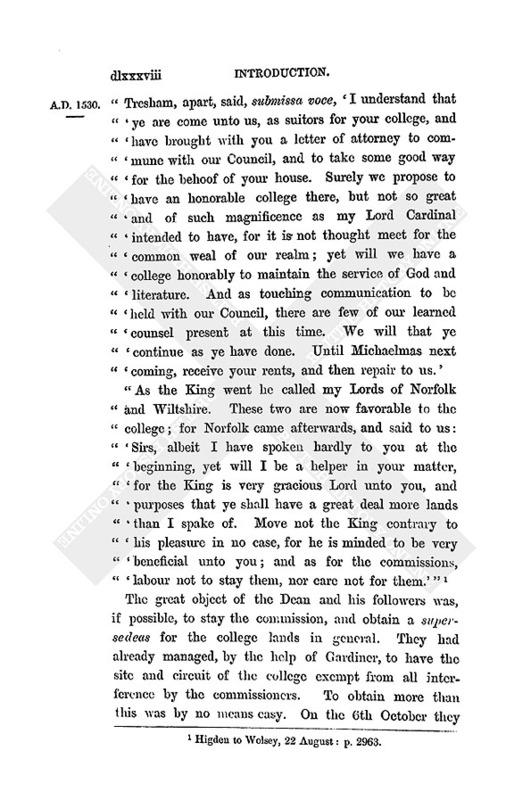 He returns to the same subject in a letter to Cromwell, begging him to continue the practices he has commenced for the bishopric of Winchester, and not to abandon them, though he has been warned to forbear speaking to the King in Wolsey's behalf;—undoubtedly by Norfolk, who had no wish that the Cardinal should have any excuse for remaining in such close proximity to the King. 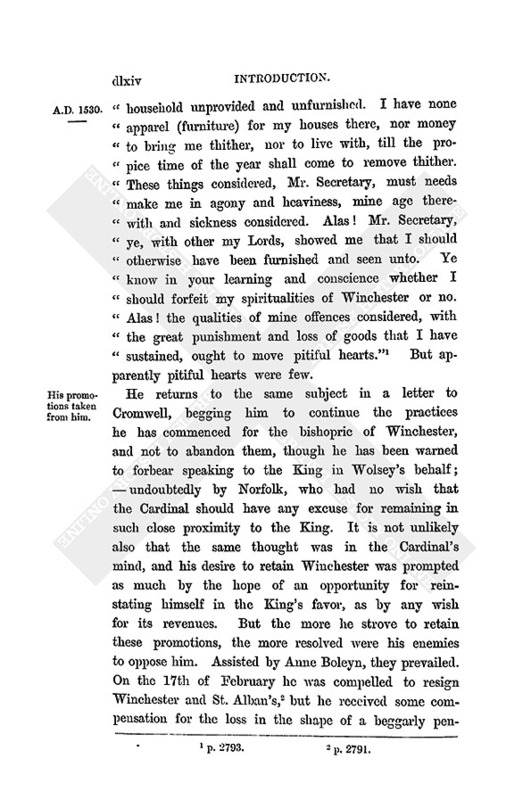 It is not unlikely also that the same thought was in the Cardinal's mind, and his desire to retain Winchester was prompted as much by the hope of an opportunity for reinstating himself in the King's favor, as by any wish for its revenues. But the more he strove to retain these promotions, the more resolved were his enemies to oppose him. Assisted by Anne Boleyn, they prevailed. On the 17th of February he was compelled to resign Winchester and St. Alban's, (fn. 32) but he received some compensation for the loss in the shape of a beggarly pen- sion of 1,000 marks. 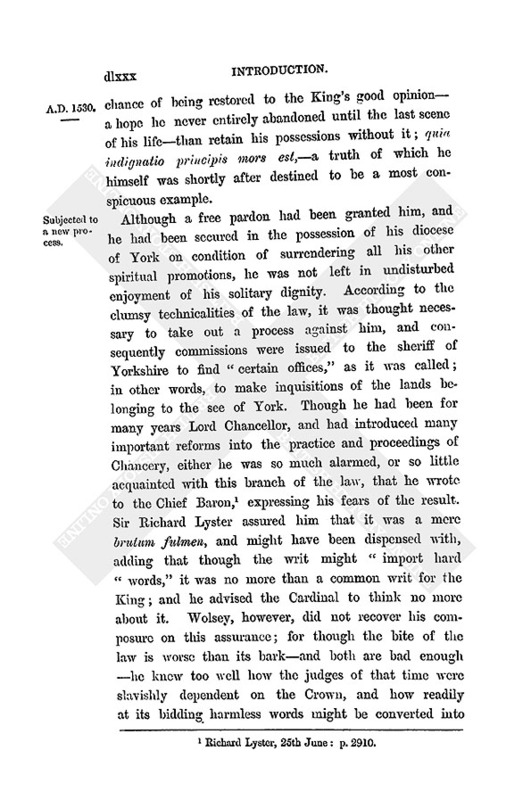 He remitted at the same time into the King's hands "the resignation of such benefices" as were under his jurisdiction at York, hoping that by these acts of submission it might now "please his Majesty to show his pity, compassion, and bounteous goodness" towards him, and not suffer him to lie any longer languishing and consuming away through extreme sorrow and heaviness. (fn. 33) He was utterly wearied and worn out by the continual vexations to which he was exposed. The promises of relief were offered, and then dashed away from his lips, as if with no other purpose than that of protracting his agony. Those who seemed to vie with each other in commiserating his misfortunes, and promising assistance, failed to make good their engagements. 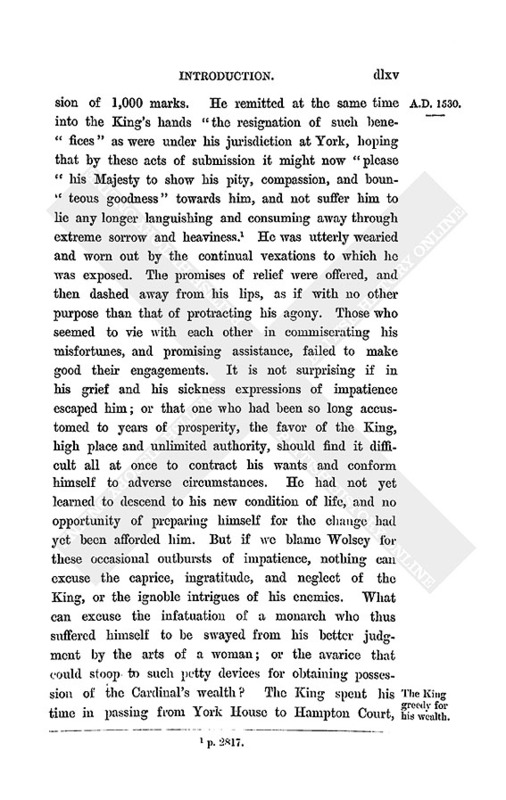 It is not surprising if in his grief and his sickness expressions of impatience escaped him; or that one who had been so long accustomed to years of prosperity, the favor of the King, high place and unlimited authority, should find it difficult all at once to contract his wants and conform himself to adverse circumstances. He had not yet learned to descend to his new condition of life, and no opportunity of preparing himself for the change had yet been afforded him. But if we blame Wolsey for these occasional outbursts of impatience, nothing can excuse the caprice, ingratitude, and neglect of the King, or the ignoble intrigues of his enemies. What can excuse the infatuation of a monarch who thus suffered himself to be swayed from his better judgment by the arts of a woman; or the avarice that could stoop to such petty devices for obtaining possession of the Cardinal's wealth? The King spent his time in passing from York House to Hampton Court, which had come into his possession by Wolsey's forfeiture. The latter had been enriched and decorated by the Cardinal's skill, and in it he had collected all that could contribute to gratify the eye or please the taste. 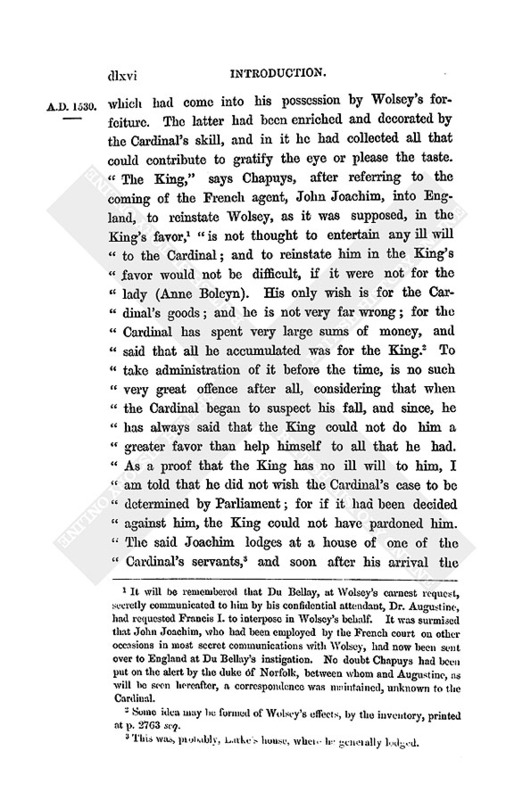 "The King," says Chapuys, after referring to the coming of the French agent, John Joachim, into England, to reinstate Wolsey, as it was supposed, in the King's favor, (fn. 34) "is not thought to entertain any ill will to the Cardinal; and to reinstate him in the King's favor would not be difficult, if it were not for the lady (Anne Boleyn). His only wish is for the Cardinal's goods; and he is not very far wrong; for the Cardinal has spent very large sums of money, and said that all he accumulated was for the King. (fn. 35) To "take administration of it before the time, is no such very great offence after all, considering that when the Cardinal began to suspect his fall, and since, he has always said that the King could not do him a greater favor than help himself to all that he had. 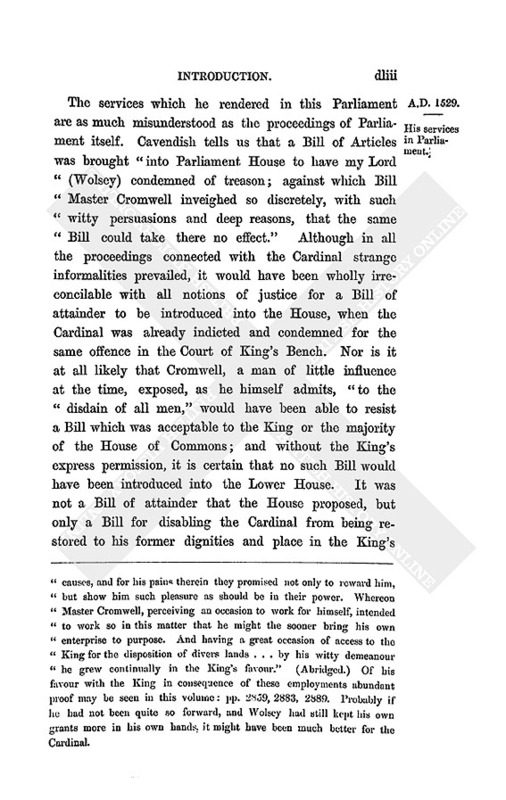 As a proof that the King has no ill will to him, I am told that he did not wish the Cardinal's case to be determined by Parliament; for if it had been decided against him, the King could not have pardoned him. The said Joachim lodges at a house of one of the Cardinal's servants, (fn. 36) and soon after his arrival the Cardinal, though unwell, sent his physician (Augustinus, a Venetian), in whom he has much confidence, and who stayed with Joachim four or five days. 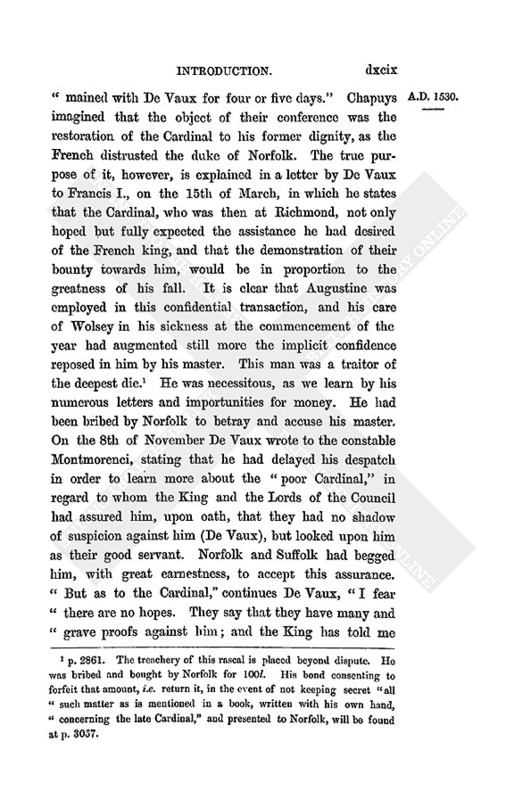 The French would spare no pains to reinstate the Cardinal, for, whatever they pretend, they have no confidence in the duke of Norfolk." His enemies resolve on his removal. Is greatly distressed for money. Takes his journey to the North. When this bitter observation was reported to Wolsey, the Cardinal replied, "Marry! Thomas, then it is time to be going, if my lord of Norfolk take it so. Therefore repair to the King, and tell him that I would gladly depart, but for want of money. The last that I received of his Majesty has been too little to pay my debts to which I have been compelled by the King's Council." Even the necessary repairs of his manor-houses could not escape censure. 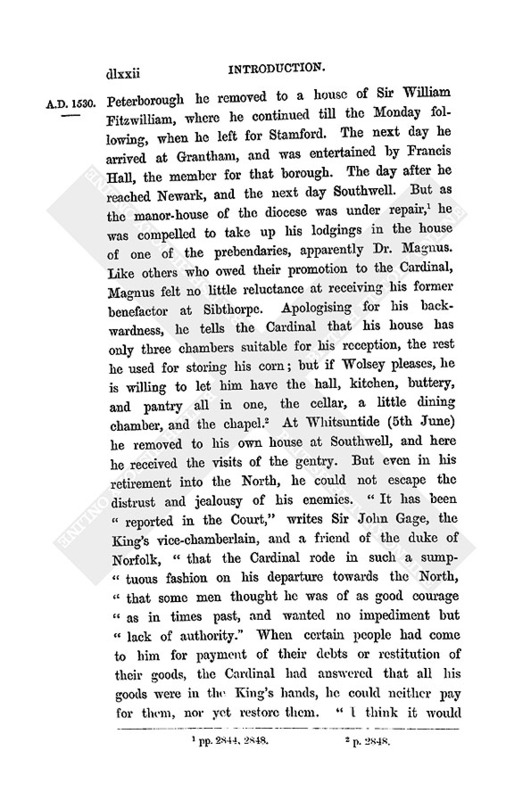 In his inability to procure suitable workmen for the repairs required at Southwell, his surveyor (fn. 48) had sent for one of the King's glaziers to glaze the Cardinal's lodgings; and we may judge of the want of skill in the workmen of those parts, that not a man could be found who could plaster the walls with lime and hair. (fn. 49) Such primitive and innocent attempts as these to render apartments tenantable to one who was aged and sickly, long accustomed to the splendid and luxurious hangings and galleries of Hampton Court and York House, were represented by his enemies as a proof that his pride was not yet sufficiently abated, nor his wings clipped close enough to prevent him from taking a higher flight whenever the opportunity was offered. "Would to God," writes one of his correspondents from London, (fn. 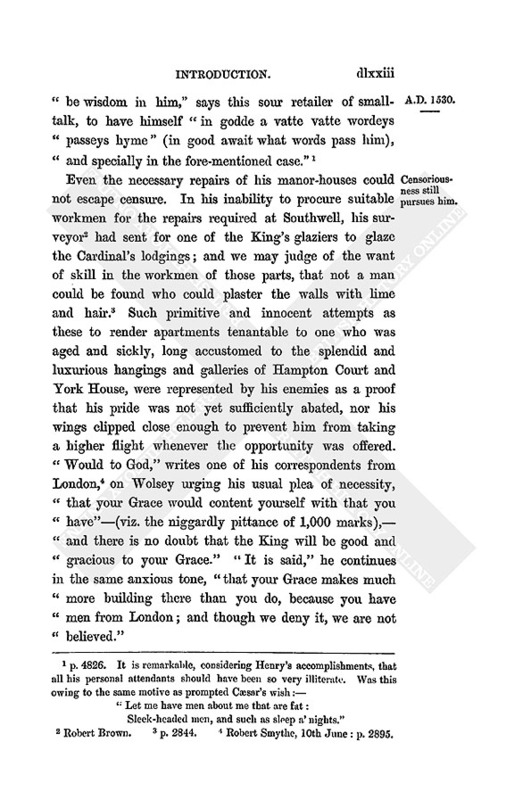 50) on Wolsey urging his usual plea of necessity, "that your Grace would content yourself with that you have"—(viz. the niggardly pittance of 1,000 marks),—"and there is no doubt that the King will be good and gracious to your Grace." "It is said," he continues in the same anxious tone, "that your Grace makes much more building there than you do, because you have men from London; and though we deny it, we are not believed." Writes to the King of his necessities. This pathetic appeal produced no effect. Absorbed in his own pleasures, or, what is equally probable, indurated by the malice of his enemies, the King took no notice of his former minister. Every method was employed by Anne Boleyn and her friends to extinguish whatever feelings of kindness or symptoms of relenting they perceived or imagined they perceived in the King. It was impossible, after twenty years' perpetual service, that the old habit of intimacy should not occasionally regain its ascendancy over the mind of Henry. Even if he had lost all his former affection for the Cardinal, he could not at times fail to contrast the superior aptitude of Wolsey, his long experience of business, his masterly genius, with the inexperience and inability of those who succeeded him. The relations between the Emperor and the King were every day becoming less satisfactory, and needed more able heads to adjust them than such as Norfolk or Suffolk possessed. 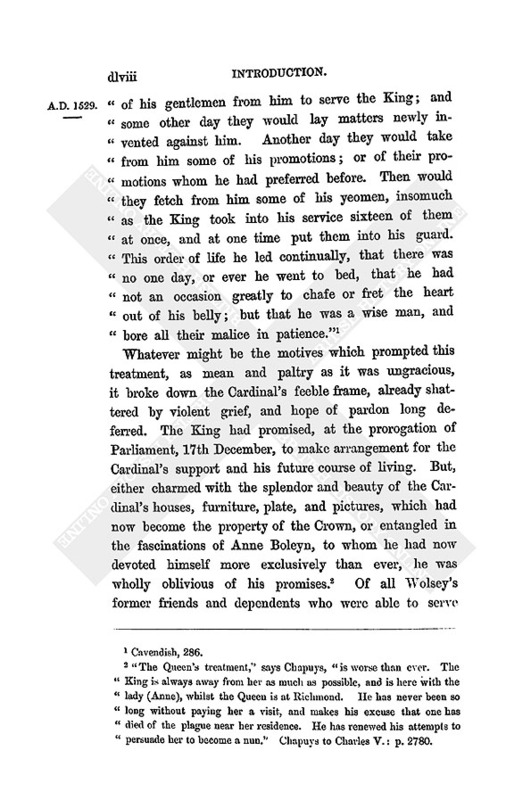 "My "Lord Cardinal is communed of," writes one of his correspondents to Dr. Bonner, afterwards the notorious Bishop of London, "and among the Lords of the "Council especially. They are afraid they shall be "compelled of necessity to recall him." (fn. 52) Against such an ignominious result Norfolk and his party were resolved to venture all hazards. They had not been scrupulous in the means they had hitherto employed to supplant the Cardinal; they were less scrupulous still in the means they employed to consummate his ruin. His new mode of life. Subjected to constant annoyance for his supposed wealth. When the Cardinal had been prevailed upon to plead guilty to the Præmunire, and surrender all his possessions and promotions to the King, he had evidently been lead to believe that he would be relieved from all further molestation. In that respect he was greatly deceived. From his fall to his death, scarcely a week was suffered to pass in which he was not subjected to some kind of alarm or interruption. The courtiers about the King were unwilling to allow such an excellent opportunity to escape them of enriching themselves with the spoils of the Church. There had been no such instance within the memory of man of a prelate being attainted for high treason, whose property offered so great a temptation to the needy and the covetous. His wealth was the envy of all men. His houses, his furniture, the magnificence of his plate, exceeded by far those of any subject, and were scarcely, if at all, inferior to those of royalty; for his taste was magnificent, and in the arts of building and decoration he surpassed all his con- temporaries. Greenwich and Windsor showed as nothing beside the glories of Hampton Court and York House. Contemporary evidence, which is wholly silent as to the royal palaces, is lavish in its praise of the spendour and beauty of the Cardinal's two great residences; and even his smaller houses at the More and at Tittenhanger were objects of Henry's cupidity. Magdalen tower in Oxford confirms the verdict of Wolsey's own age; and if Christ Church falls short of the beauty and grandeur of the design which he intended for it, that is owing to the fact that his work was marred, crippled, and disfigured by the avarice of the King and the flattery of those to whom Henry lent a willing ear. Besides the archbishopric of York, he held Winchester and St. Alban's; though from Winchester, for which he had given up Durham, he had at his fall received no emoluments except the 1000 marks already mentioned, while his revenues from St. Alban's were inconsiderable. 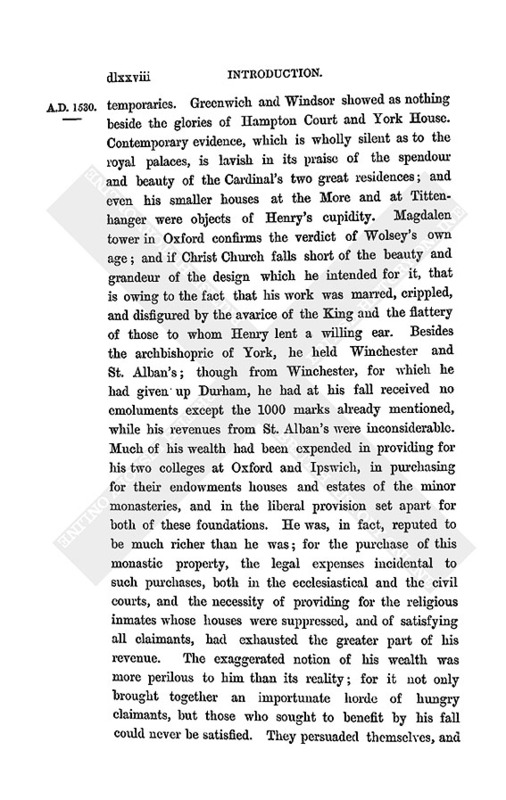 Much of his wealth had been expended in providing for his two colleges at Oxford and Ipswich, in purchasing for their endowments houses and estates of the minor monasteries, and in the liberal provision set apart for both of these foundations. 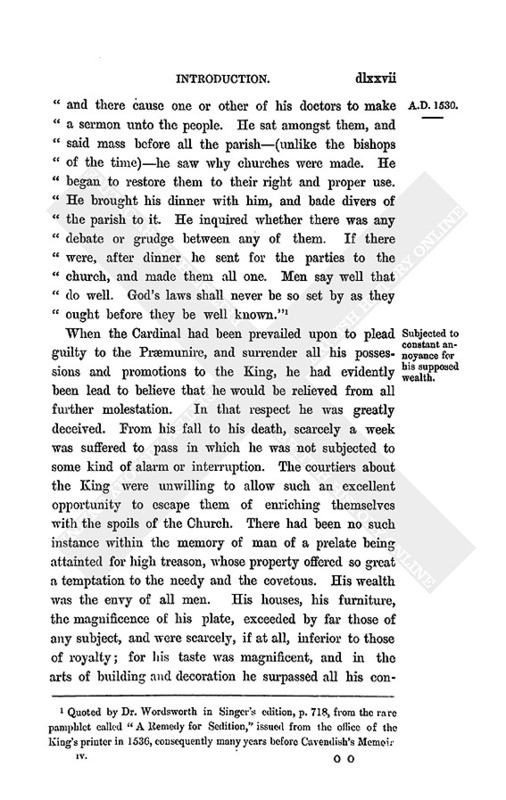 He was, in fact, reputed to be much richer than he was; for the purchase of this monastic property, the legal expenses incidental to such purchases, both in the ecclesiastical and the civil courts, and the necessity of providing for the religious inmates whose houses were suppressed, and of satisfying all claimants, had exhausted the greater part of his revenue. The exaggerated notion of his wealth was more perilous to him than its reality; for it not only brought together an importunate horde of hungry claimants, but those who sought to benefit by his fall could never be satisfied. They persuaded themselves, and they persuaded the King, that the Cardinal must have concealed his wealth; that he had hoarded his treasures, and they had only to search diligently enough, and worry him enough, to have their search rewarded. So in this spirit they ceased not to torment and alarm him in his distant exile; and in this spirit the King turned a deaf and obdurate ear to all his supplications for relief. Why he pleaded guilty to the Præmunire. Talking the matter over on one occasion with Cavendish, who had remarked to him that people wondered how one of "so excellent a wit and high discretion" would so simply confess himself guilty in the Præmunire, when he might well have stood the trial, Wolsey explained his motives. 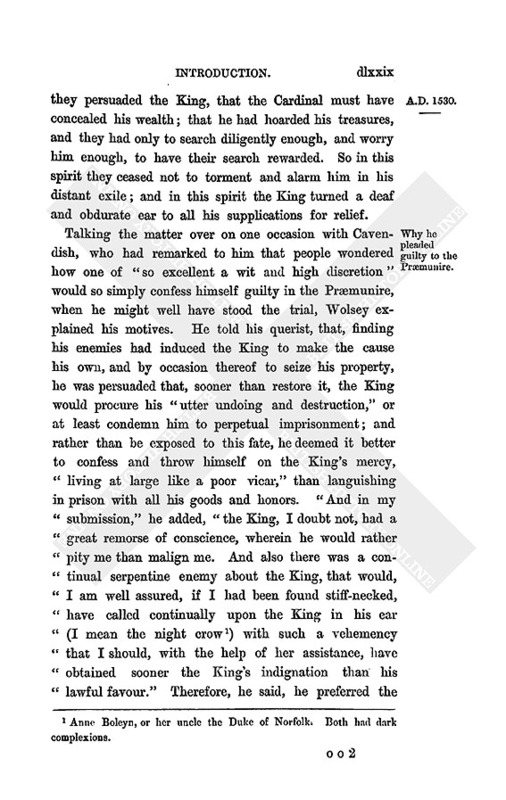 He told his querist, that, finding his enemies had induced the King to make the cause his own, and by occasion thereof to seize his property, he was persuaded that, sooner than restore it, the King would procure his "utter undoing and destruction," or at least condemn him to perpetual imprisonment; and rather than be exposed to this fate, he deemed it better to confess and throw himself on the King's mercy, "living at large like a poor vicar," than languishing in prison with all his goods and honors. "And in my submission," he added, "the King, I doubt not, had a great remorse of conscience, wherein he would rather pity me than malign me. And also there was a continual serpentine enemy about the King, that would, I am well assured, if I had been found stiff-necked, have called continually upon the King in his ear (I mean the night crow (fn. 55) ) with such a vehemency that I should, with the help of her assistance, have obtained sooner the King's indignation than his lawful favour." Therefore, he said, he preferred the chance of being restored to the King's good opinion—a hope he never entirely abandoned until the last scene of his life—than retain his possessions without it; quia indignatio principis mors est,—a truth of which he himself was shortly after destined to be a most conspicuous example. Subjected to a new process. The destruction of his colleges was regarded by Wolsey with inexpressible anguish and dismay. They had formed for years the darling project of his life. The old feeling of founder and benefactor-scorned and ridiculed by hebdomadal philosophers in these days-had not yet died out in an age when munificence was still regarded as a virtue. Amidst the transitory glory and demoralizing occupations of this life, men still craved for a permanent resting-place, where their memories should be associated with the pure and uncorrupted affections of the young, and thoughts of themselves should rise to Heaven in prayers and orisons uttered by lips as yet untarnished by the world. 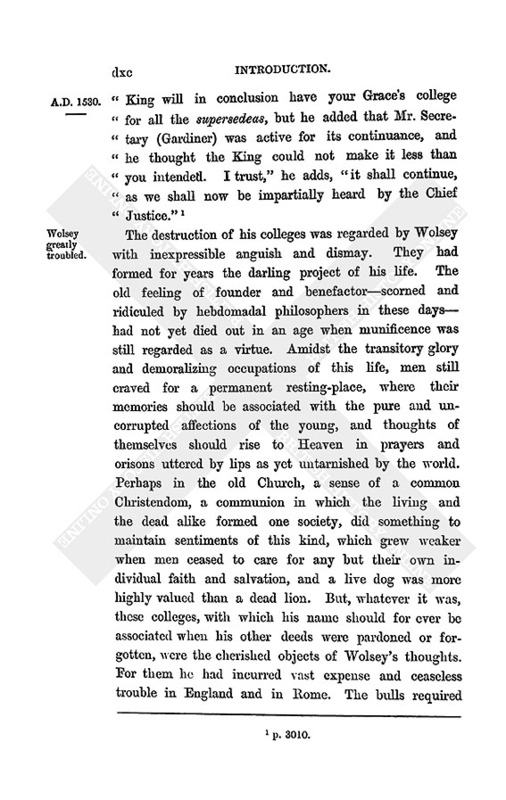 Perhaps in the old Church, a sense of a common Christendom, a communion in which the living and the dead alike formed one society, did something to maintain sentiments of this kind, which grew weaker when men ceased to care for any but their own individual faith and salvation, and a live dog was more highly valued than a dead lion. But, whatever it was, these colleges, with which his name should for ever be associated when his other deeds were pardoned or forgotten, were the cherished objects of Wolsey's thoughts. For them he had incurred vast expense and ceaseless trouble in England and in Rome. The bulls required before any monastic house could be suppressed and converted to secular uses were numerous and costly, whilst the cumbrous legal proceedings involved in the transfer of property, the cancelling and renewal of leases, were enormous. The legal procedure of two courts, the secular and ecclesiastical, with their minute and endless technicalities, would have dismayed one of less courage and determination than Wolsey. But now all the hopes and labours of many years were to be given to the winds—for a hard construction of the law—for a mere flaw, which no lawyer of the time, however astute, could possibly have foreseen. One single expression in the transfer of these collegiate estates might have saved them,—would save them even now, if the King, instead of taking advantage of the error, and insisting upon the strict letter of the law, had been willing to accept a moral and equitable construction. But the temptation was too strong for him, and he hardened himself against all sentiments of generosity. The easy acquisition of Wolsey's houses, manors, property, plate, and furniture, instead of satisfying, excited still more the cupidity of his master. The old failing, of which indications were visible in earlier times, now began to display itself in a more unmistakeable manner. The exactions from the clergy, the seizure of Church property, the suppression of religious foundations, are traceable to that spirit of greed, which he had inherited from his father. The example thus set by the King was followed, as it was recommended by the nobility. Schemes of Church spoliation, after the fall of Wolsey, are among the most frequent and the most popular devices of the age. Employs all his energies to save his college at Oxford. 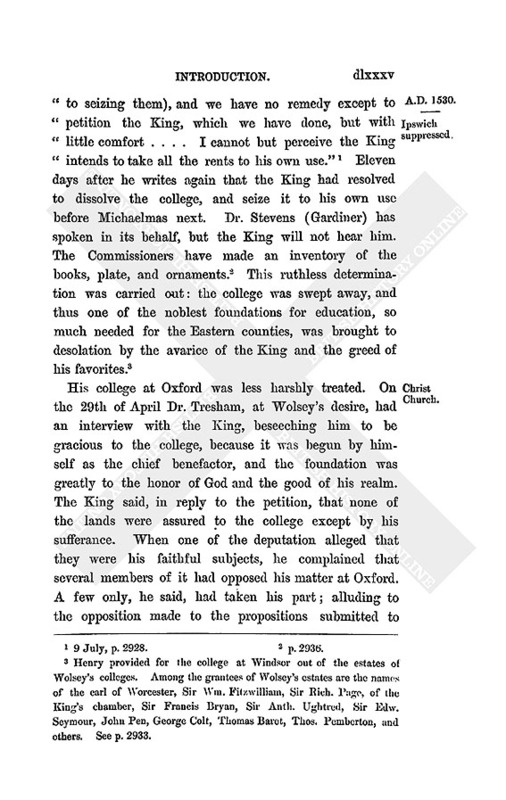 As all hope of preserving his new foundation at Ipswich had failed, his utmost efforts were now directed to the preservation of his college at Oxford. 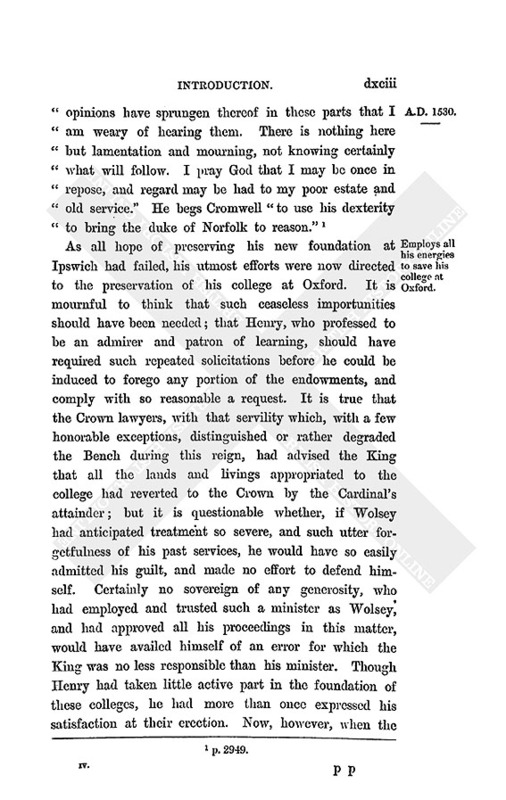 It is mournful to think that such ceaseless importunities should have been needed; that Henry, who professed to be an admirer and patron of learning, should have required such repeated solicitations before he could be induced to forego any portion of the endowments, and comply with so reasonable a request. 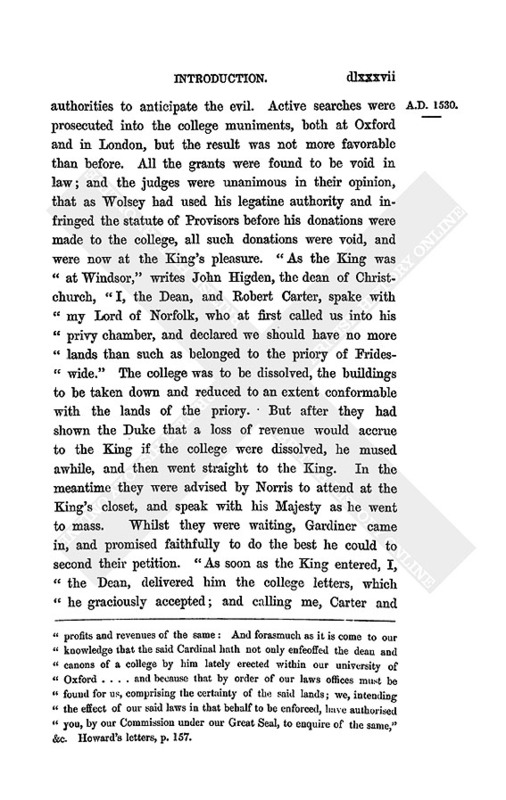 It is true that the Crown lawyers, with that servility which, with a few honorable exceptions, distinguished or rather degraded the Bench during this reign, had advised the King that all the lands and livings appropriated to the college had reverted to the Crown by the Cardinal's attainder; but it is questionable whether, if Wolsey had anticipated treatment so severe, and such utter forgetfulness of his past services, he would have so easily admitted his guilt, and made no effort to defend himself. Certainly no sovereign of any generosity, who had employed and trusted such a minister as Wolsey, and had approved all his proceedings in this matter, would have availed himself of an error for which the King was no less responsible than his minister. Though Henry had taken little active part in the foundation of these colleges, he had more than once expressed his satisfaction at their erection. 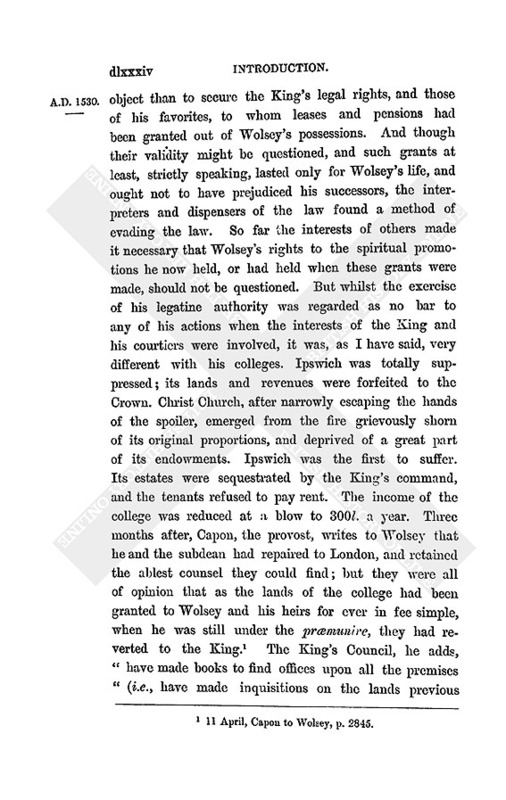 Now, however, when the chance was offered him of converting their property to his own use, Wolsey's design was deemed too magnificent; a more meagre provision was considered sufficient for all purposes of education. His enemies contrive his total ruin. He was not destined to learn the result of all these earnest entreaties and efforts. Matters were fast drawing to a close. Towards the end of September he left Scroby for Cawood Castle, a few miles distant from York, confirming many children that were brought to him, both at St. Oswald's Abbey and at Ferrybridge. More than six months had now elapsed since he had left London,—a period unusually long, even in those days,—and he had not yet reached his metropolitan city; nor, so far as it appears, had he yet visited his cathedral. The reason for this delay is to be found in the fact that it was not usual for the archbishop to enter his metropolitan church until after his installation,—a ceremony of some magnificence, followed by a sumptuous feast, of which archbishop Neville, one of his predecessors, had set an extraordinary example. 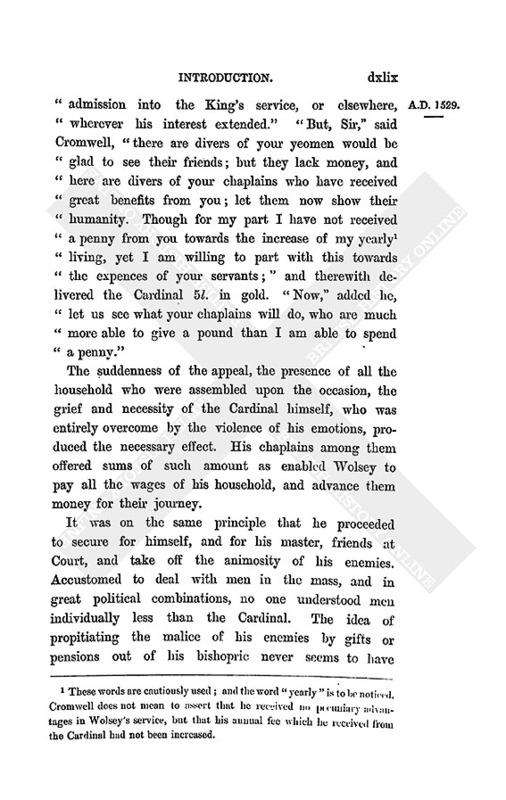 Stript of all his property, and reduced to great distress, it is clear that the Cardinal had not the means of providing what was considered necessary for the occasion, and he waited consequently until his rents had been received, in order that his installation feast might not be wholly unworthy of his fame and dignity. 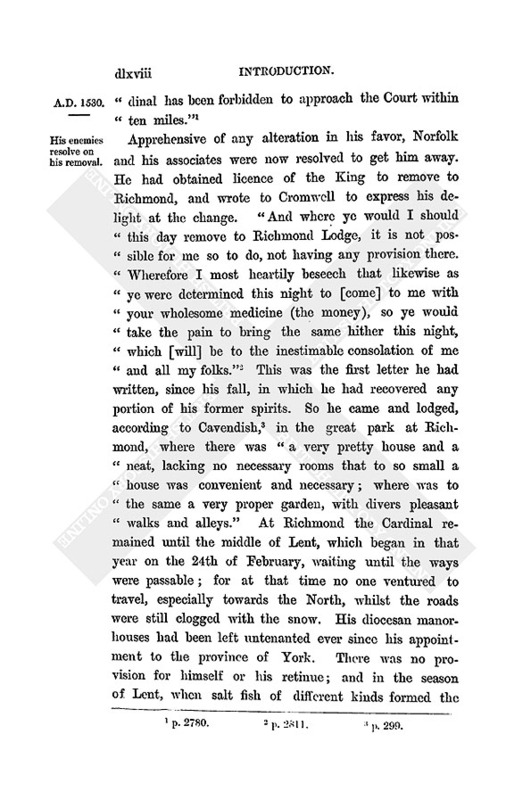 A list of the debts incurred by him during his residence at Cawood may be seen in this volume, (fn. 73) and of the provisions received by his officers against the proposed ceremony. In this manner the whole month of October passed away without any event of importance. On a visit from Dr. Higden, the dean of York, and the prebendaries, who had given him to understand that, according to precedent, he could not enter the choir, nor have even a stall there, until after his installation, he ordered it to take place on Monday, the 7th of November. When the event became generally known in the diocese, many presents of wild fowl, venison, and other provisions, were offered by the gentlemen and the religious houses of the county; all of whom, equally with the Cardinal himself, had not the least anticipation of the event that was so soon to follow. It will be seen by what has been already stated, that his enemies had not ceased to keep a watchful eye upon his movements. Prompted by jealousy and suspicion, they had contrived to gain intelligence of all his words and actions, far removed as he was from the Court. Messengers passing continually to and fro, and keeping the Cardinal in a continual ferment of agitation and alarm, had not failed to carry back to their employers exaggerated accounts of his doings. It had never been expected that he would apply himself so heartily to the spiritual duties of his province, or gain so rapidly the affections of those with whom he was now for the first time associated. 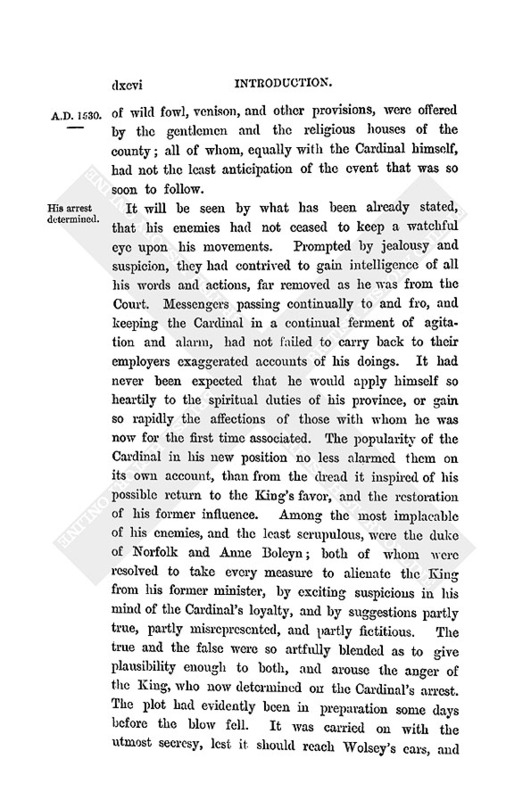 The popularity of the Cardinal in his new position no less alarmed them on its own account, than from the dread it inspired of his possible return to the King's favor, and the restoration of his former influence. Among the most implacable of his enemies, and the least scrupulous, were the duke of Norfolk and Anne Boleyn; both of whom were resolved to take every measure to alienate the King from his former minister, by exciting suspicious in his mind of the Cardinal's loyalty, and by suggestions partly true, partly misrepresented, and partly fictitious. The true and the false were so artfully blended as to give plausibility enough to both, and arouse the anger of the King, who now determined on the Cardinal's arrest. The plot had evidently been in preparation some days before the blow fell. It was carried on with the utmost secresy, lest it should reach Wolsey's ears, and give him an opportunity of defending himself, or explaining his conduct to the King. 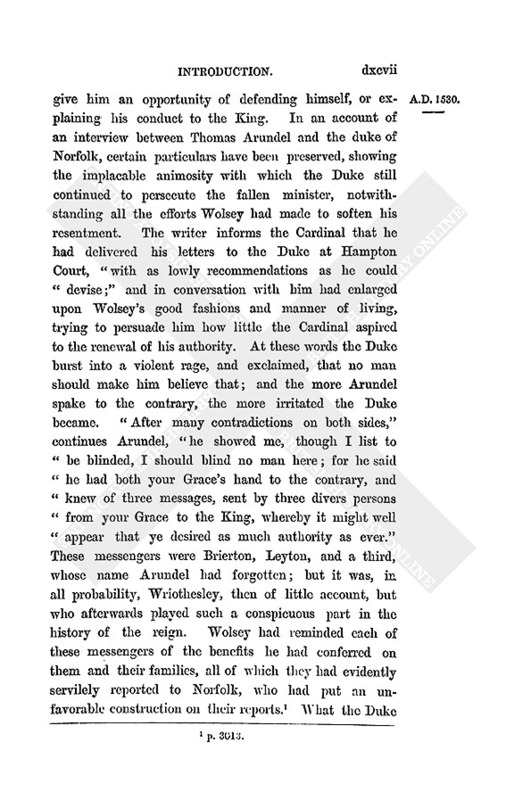 In an account of an interview between Thomas Arundel and the duke of Norfolk, certain particulars have been preserved, showing the implacable animosity with which the Duke still continued to persecute the fallen minister, notwithstanding all the efforts Wolsey had made to soften his resentment. The writer informs the Cardinal that he had delivered his letters to the Duke at Hampton Court, "with as lowly recommendations as he could devise;" and in conversation with him had enlarged upon Wolsey's good fashions and manner of living, trying to persuade him how little the Cardinal aspired to the renewal of his authority. At these words the Duke burst into a violent rage, and exclaimed, that no man should make him believe that; and the more Arundel spake to the contrary, the more irritated the Duke became. 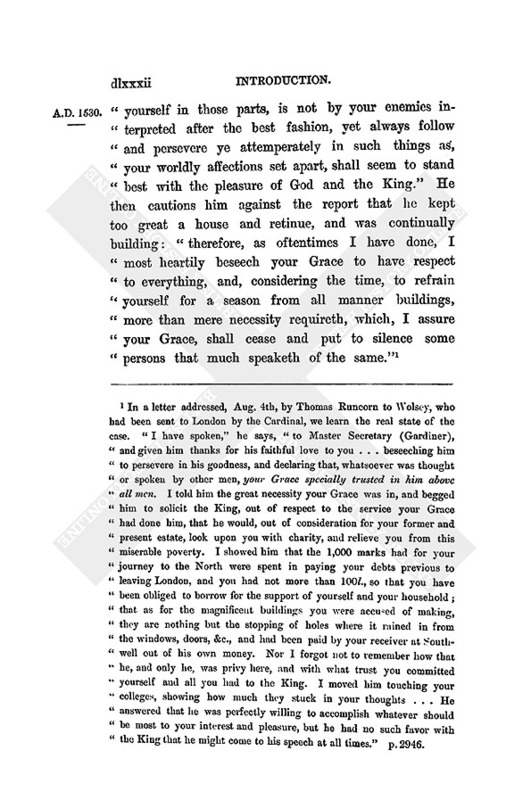 "After many contradictions on both sides," continues Arundel, "he showed me, though I list to be blinded, I should blind no man here; for he said he had both your Grace's hand to the contrary, and knew of three messages, sent by three divers persons from your Grace to the King, whereby it might well appear that ye desired as much authority as ever." These messengers were Brierton, Leyton, and a third, whose name Arundel had forgotten; but it was, in all probability, Wriothesley, then of little account, but who afterwards played such a conspicuous part in the history of the reign. Wolsey had reminded each of these messengers of the benefits he had conferred on them and their families, all of which they had evidently servilely reported to Norfolk, who had put an unfavorable construction on their reports. (fn. 74) What the Duke meant by the proofs he had received in Wolsey's handwriting, and how he had obtained them, must now be explained. On the spirit and tone of this interview I leave my readers to their own reflections. Its baseness must be shared between the servile minister, the treacherous sovereign, the ungrateful master. I pass on to the further revelation of the scheme now set on foot by the Cardinal's unscrupulous and unrelenting enemies, who, noble as they were by birth, and the chief advisers of the King, had committed themselves to a course of treachery, falsehood, and deceit unknown to all historians. The ordinary chroniclers of the day accepted the official account of Wolsey's crimes without examination, probably without suspicion. That account has been repeated since with little variation to the present time; and popular misconceptions have borne as hardly and unjustly on Wolsey's memory in this respect, as the ingratitude of his sovereign and the malice of his enemies could have desired. No compunction was felt for his wretchedness—no respite was allowed to his sufferings. Month after month they harrassed him as we have seen, broken as he was in health and fortune, and worn out by labors such as no statesman had ever endured. 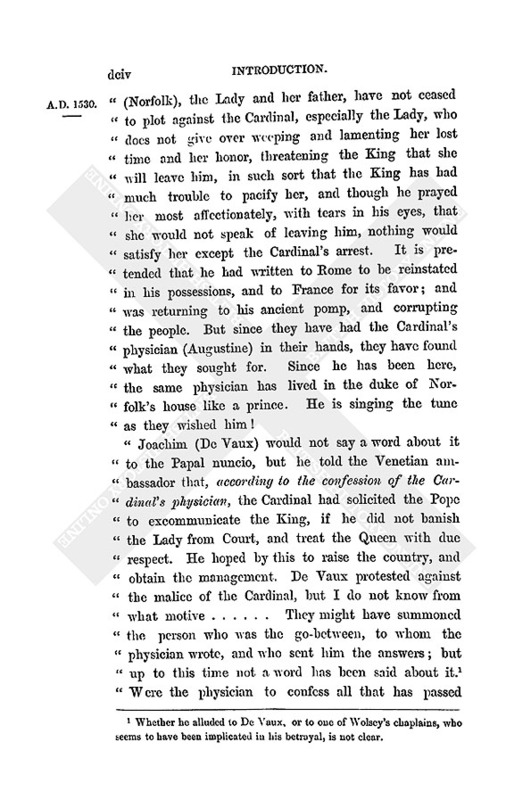 In a letter from the Imperial ambassador to the emperor Charles V., we come upon minute and authentic details of the plot laid against the Cardinal's life, and of the profound cunning and dissimulation with which it was carried on. "Eight days ago," he writes, "the King gave orders for the Cardinal to be brought here, on which the Cardinal remained for some days without food, hoping rather to finish his life in this way (fn. 82) than in a more shameful one, of which he had some fears. He has been taken ill on the road, and has not yet arrived. It is said he is to be lodged in the same chamber in the Tower where the duke of Buckingham was detained. The cause of his arrest is a mere conjecture. A gentleman told me that a short time ago the King was complaining to his Council of something that was not done according to his liking, and said in a rage that the Cardinal was a better man than any of them for managing matters; and, repeating this twice, he flung himself out of the room. 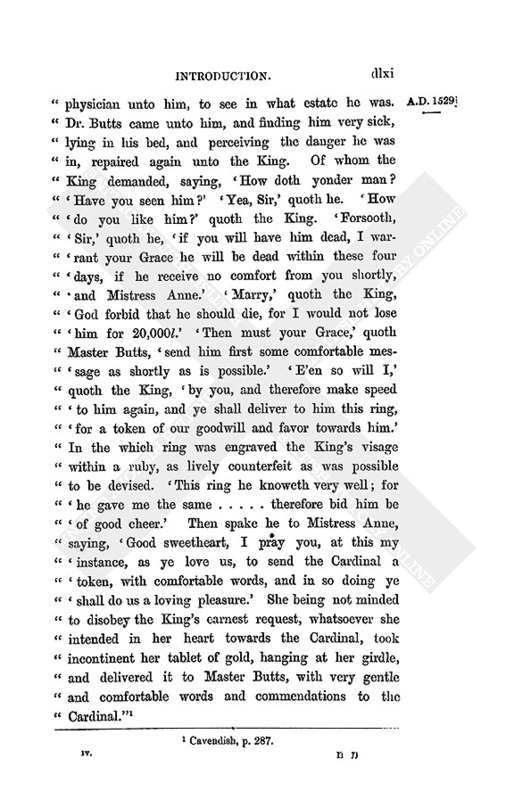 Since then the Duke (Norfolk), the Lady and her father, have not ceased to plot against the Cardinal, especially the Lady, who does not give over weeping and lamenting her lost time and her honor, threatening the King that she will leave him, in such sort that the King has had much trouble to pacify her, and though he prayed her most affectionately, with tears in his eyes, that she would not speak of leaving him, nothing would satisfy her except the Cardinal's arrest. It is pretended that he had written to Rome to be reinstated in his possessions, and to France for its favor; and was returning to his ancient pomp, and corrupting the people. But since they have had the Cardinal's physician (Augustine) in their hands, they have found what they sought for. Since he has been here, the same physician has lived in the duke of Norfolk's house like a prince. He is singing the tune as they wished him ! 2. This is fully confirmed by Cromwell's will. Whatever he may have been in after-life, he had not attached himself during Wolsey's time to the doctrines of the Reformation. Nor, indeed, would that have been possible; for as mass was celebrated daily in Wolsey's household, Cromwell could scarcely have systematically absented himself from it without attracting attention. 3. This is one of the bombastic phrases put by Shakspeare into the mouth of Bottom the weaver. And Shakspeare had certainly read Cavendish. 6. These words are cautiously used; and the word "yearly" is to be noticed. 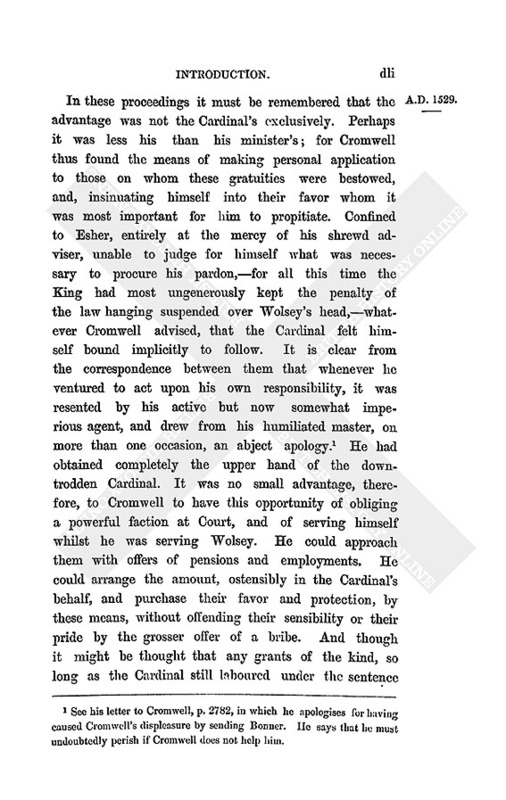 Cromwell does not mean to assert that he received no pecuniary advantages in Wolsey's service, but that his annual fee which he received from the Cardinal had not been increased. 7. How that could be I do not profess to understand. The house belonged to the see of York, and if what the Judges declared was the law, and the King might claim it as his own, and rob the see of its property for Wolsey's personal offence, what necessity was there for obtaining a recognizance from Wolsey? But lawyers were now in the ascendant. 9. 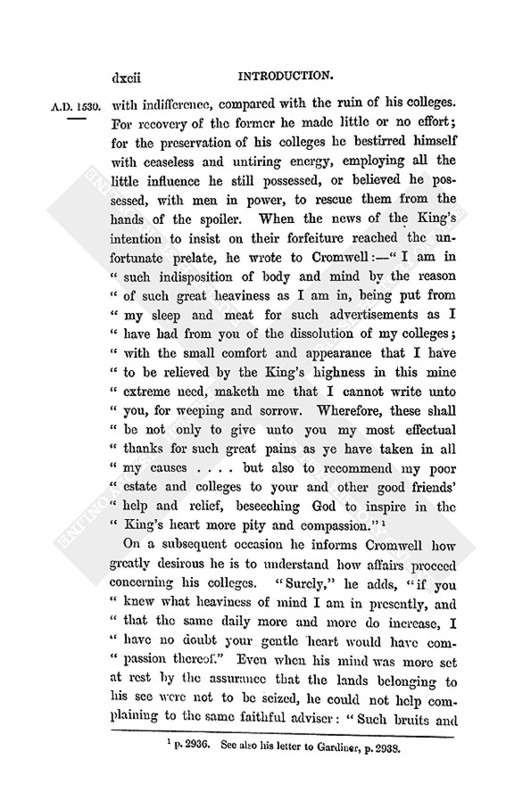 See his letter to Cromwell, p. 2782, in which he apologises for having caused Cromwell's displeasure by sending Bonner. He says that he must undoubtedly perish if Cromwell does not help him. 10. See p. 2788. Cavendish, p. 282. 11. 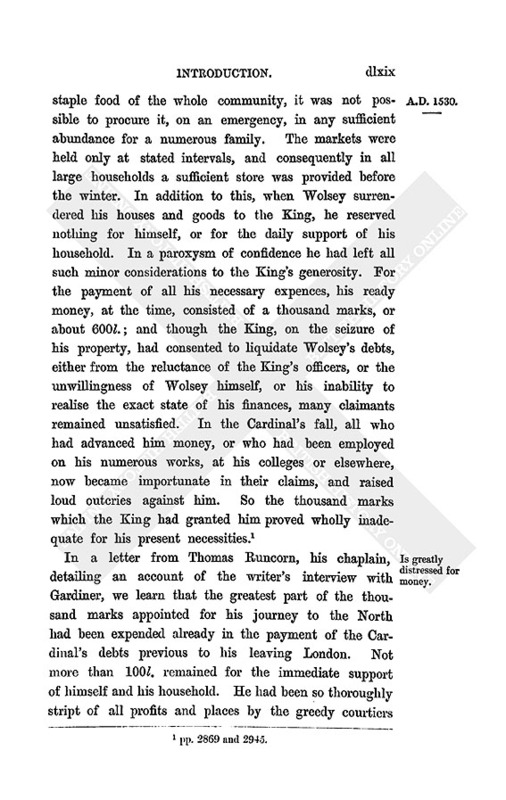 "It came at length so to pass," says Cavendish (p. 295), "that those to whom the King's Majesty had given any annuities or fees for term of life by patent out of Wolsey's revenues could not be good but only during my Lord's life, forasmuch as the King had no longer estate or title therein, which came to him by reason of my Lord's attainder in the Præmunire; and to make their dates good and sufficient according "to their patents, it was thought necessary to have my Lord's confirmation unto these grants. And this to be brought about there was no other mean but to make suit to Master Cromwell to obtain their confirmation at my Lord's hands. 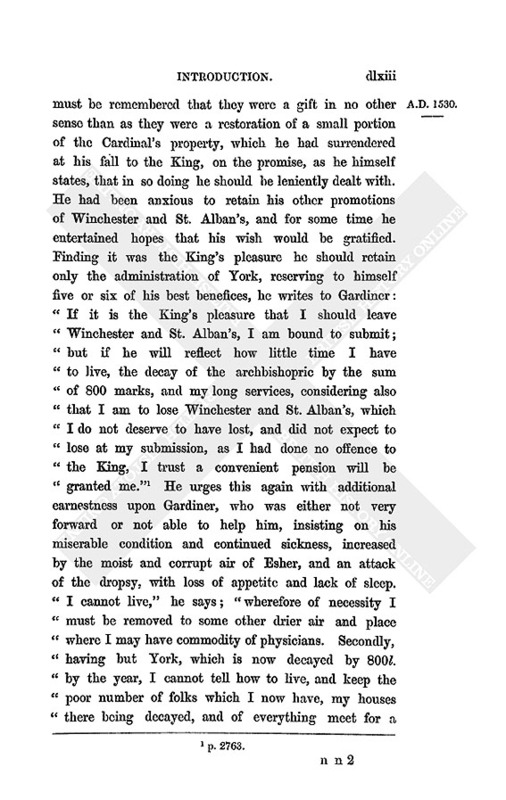 Then began both noblemen and other who had any patents of the King, and either of Winchester or St. Alban's, to make earnest suit to Master Cromwell for to solicit their causes, and for his pains therein they promised not only to reward him, but show him such pleasure as should be in their power. Whereon Master Cromwell, perceiving an occasion to work for himself, intended to work so in this matter that he might the sooner bring his own enterprise to purpose. And having a great occasion of access to the King for the disposition of divers lands ... by his witty demeanour he grew continually in the King's favour." (Abridged.) Of his favour with the King in consequence of these employments abundant proof may be seen in this volume: pp. 2859, 2883, 2889. 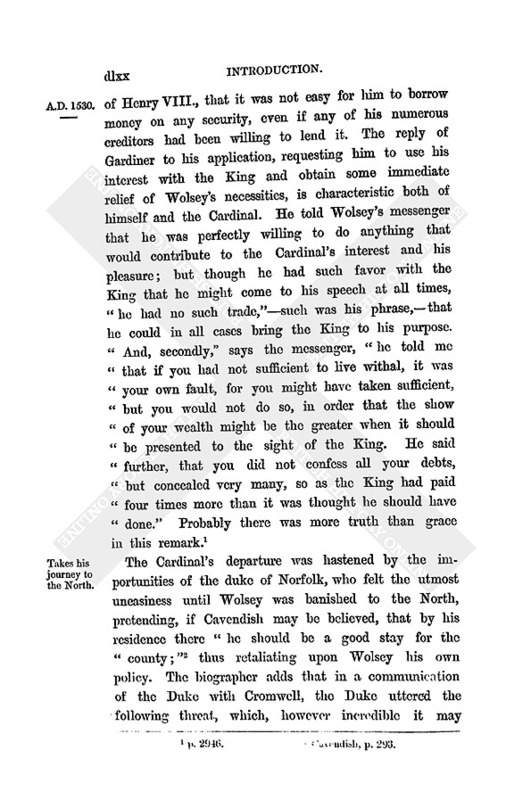 Probably if he had not been quite so forward, and Wolsey had still kept his own grants more in his own hands, it might have been much better for the Cardinal. 12. Much has been made of an expression in one of Henry's letters to the Pope, insisting on the importance and independence of Parliament. But those who use it overlook the whole purpose and tenor of the letter. To frighten Clement into compliance, the King had induced the Parliament to insist on discontinuing the annates paid to Rome. To give this act greater effect he pointed out to the Pope the dangerous consequences of such an attack on the great sources of the Papal revenue, hoping that his example would be followed by others. He gave out, at the same time, as an inducement for the Pope to comply with his wishes, that it rested entirely with himself to give efficiency to the wishes of Parliament. In other words, if Clement would grant the divorce, the annates should continue, in spite of the Parliament's wishes. An odd way, certainly, of showing its independence and importance. 13. 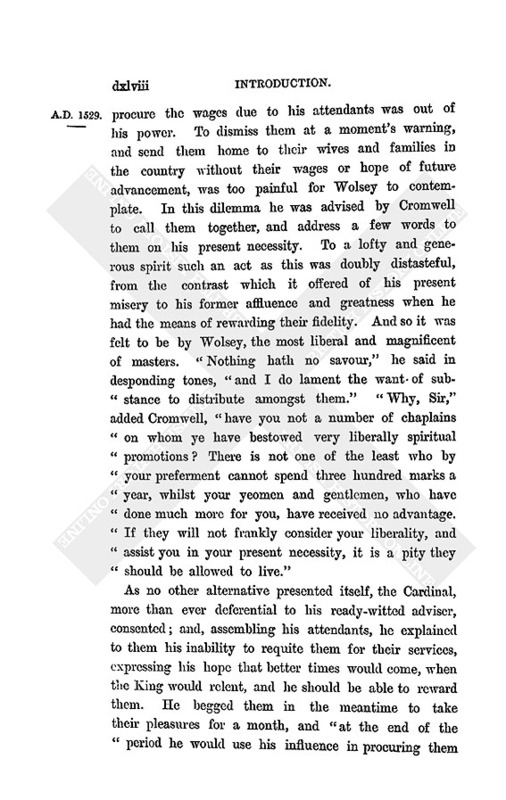 The animus of Darcy may be inferred from his own statement, p. 2554, in which he expresses his anger that, owing to Wolsey, he had been deprived of the captainship of Berwick, and the wardenship of the Marches, worth 100l. a year. 15. 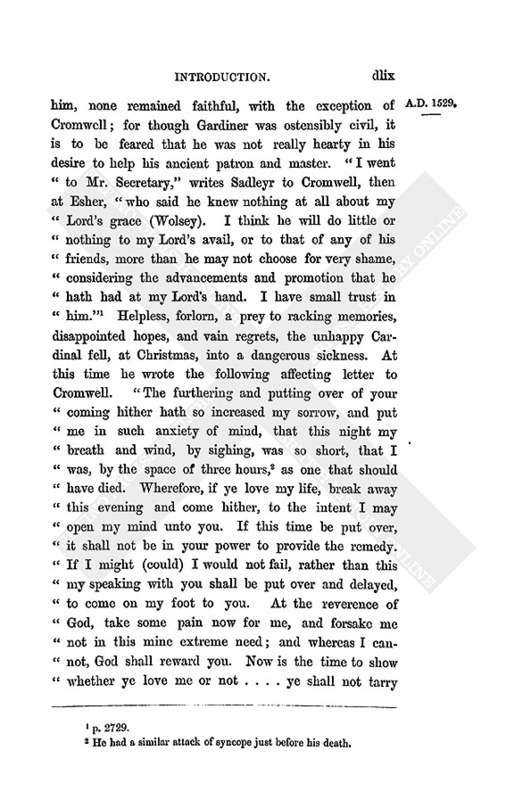 "Good it is, in my poor opinion," says Darcy, "that after he is sequestered in sure keeping, the King's grace, by good and secret espials in Rome, France, and in all outward strange countries, enquire well of all his affairs there, and also by straight examination of himself to be taken, and by searching of his books and examining his councils." p. 2549. All that popular malice and misrepresentation ever raked up against the Cardinal is here sedulously noted. 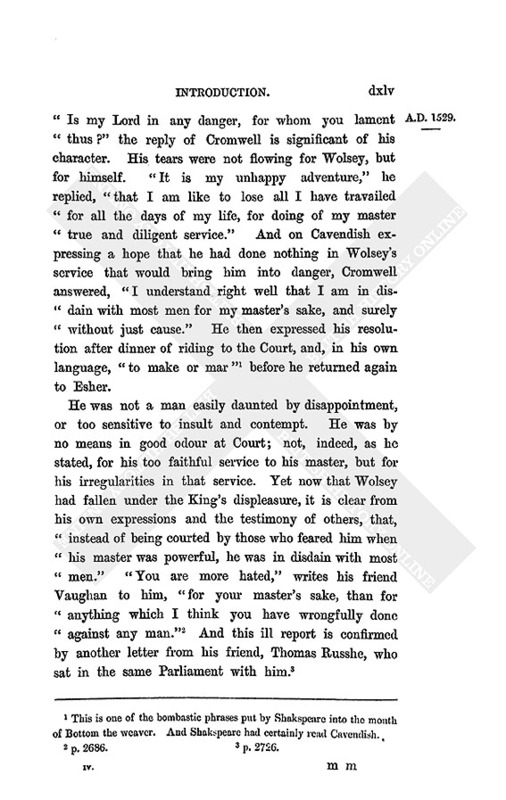 It seems that Darcy was upon friendly terms with the duke of Norfolk, and it is not improbable that through the Duke's means these accusations were submitted to the King. 16. The famous expression, "Ego et Rex meus," which Hall mentions as one of the charges, is a deliberate perversion of the original. 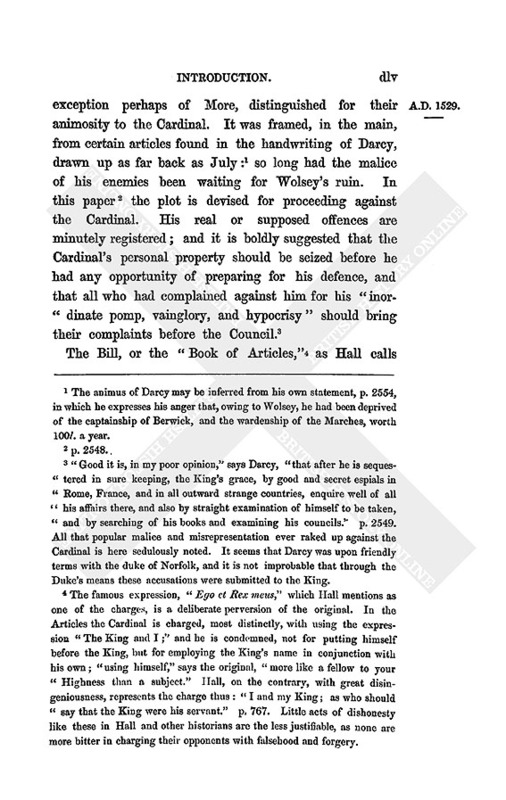 In the Articles the Cardinal is charged, most distinctly, with using the expression "The King and I;" and he is condemned, not for putting himself before the King, but for employing the King's name in conjunction with his own; "using himself," says the original, "more like a fellow to your Highness than a subject." Hall, on the contrary, with great disingeniousness, represents the charge thus: "I and my King; as who should say that the King were his servant." p. 767. Little acts of dishonesty like these in Hall and other historians are the less justifiable, as none are more bitter in charging their opponents with falsehood and forgery. 17. 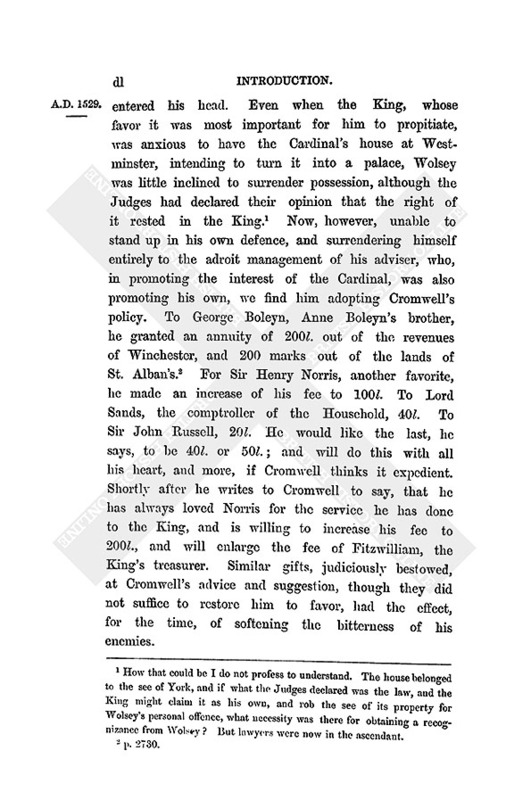 The persons to whom he refers are the dukes of Norfolk and Suffolk, and secretary Gardiner; though we have no official record of this transaction. In a letter to Cromwell, written about 17 December, he urges Cromwell to use his efforts with these men, as they knew what promises had been made to him, upon "the trust and confidence whereof" Wolsey had been induced to make his submission, and put himself wholly into the King's hands, "who by the rigor of his laws could not have had so much as his Grace now hath." State Papers, I. 352. 18. p. 2762. Compare his letter to Gardiner, p. 2793, and Cavendish, 275. 19. p. 2681. Cavendish, 271. 20. p. 2717; and Cavendish, 279. 22. "The Queen's treatment," says Chapuys, "is worse than ever. The King is always away from her as much as possible, and is here with the lady (Anne), whilst the Queen is at Richmond. He has never been so long without paying her a visit, and makes his excuse that one has died of the plague near her residence. He has renewed his attempts to persuade her to become a nun." Chapuys to Charles V.: p. 2780. 24. He had a similar attack of syncope just before his death. 26. Augustinus to Cromwell, 19 January 1530, p. 2747. He corresponded with Cromwell in Italian, thus confirming the report of Cromwell's Italian scholarship. 34. 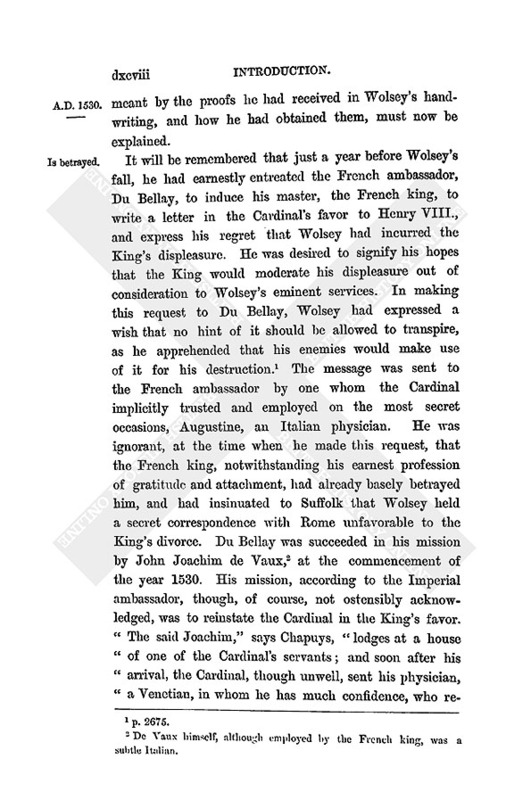 It will be remembered that Du Bellay, at Wolsey's earnest request, secretly communicated to him by his confidential attendant, Dr. Augustine, had requested Francis I. to interpose in Wolsey's behalf. 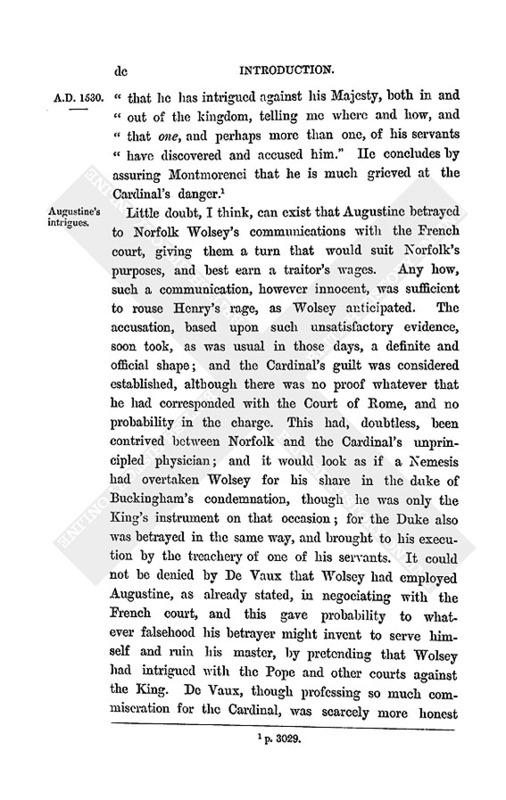 It was surmised that John Joachim, who had been employed by the French court on other occasions in most secret communications with Wolsey, had now been sent over to England at Du Bellay's instigation. No doubt Chapuys had been put on the alert by the duke of Norfolk, between whom and Augustine, as will be seen hereafter, a correspondence was maintained, unknown to the Cardinal. 35. 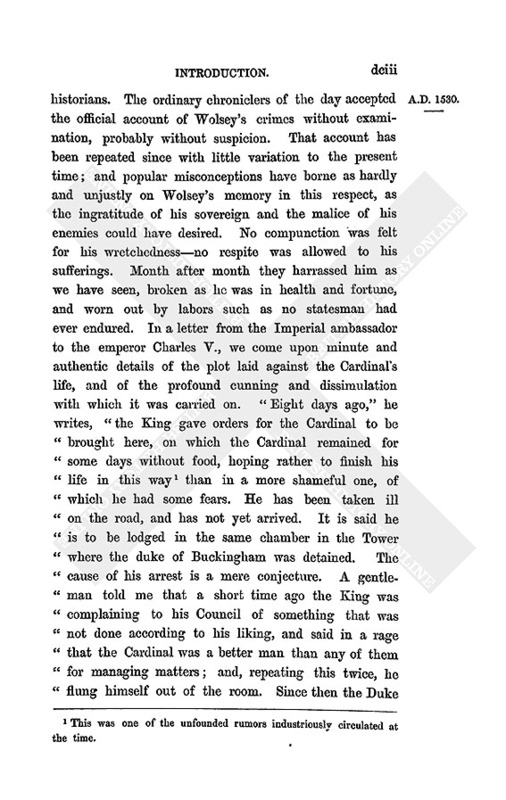 Some idea may be formed of Wolsey's effects, by the inventory, printed at p. 2763 seq. 36. This was, probably, Larke's house, where he generally lodged. 40. pp. 2869 and 2945. 47. p. 4826. It is remarkable, considering Henry's accomplishments, that all his personal attendants should have been so very illiterate. Was this owing to the same motive as prompted Cæsar's wish:— "Let me have men about me that are fat: Sleek-headed men, and such as sleep a' nights." 50. Robert Smythe, 10th June: p. 2895. 51. The passages in italics have been afterwards struck out. p. 2849. 53. That is, the people of the North, who were then in rebellion. 54. 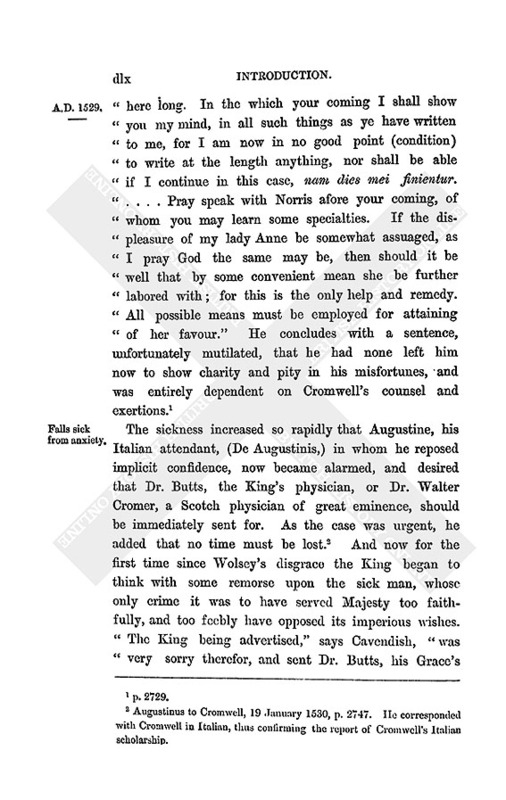 Quoted by Dr. Wordsworth in Singer's edition, p. 718, from the rare pamphlet called "A Remedy for Sedition," issued from the office of the King's printer in 1536, consequently many years before Cavendish's Memoir. 55. Anne Boleyn, or her uncle the Duke of Norfolk. Both had dark complexions. 56. Richard Lyster, 25th June: p. 2910. 57. 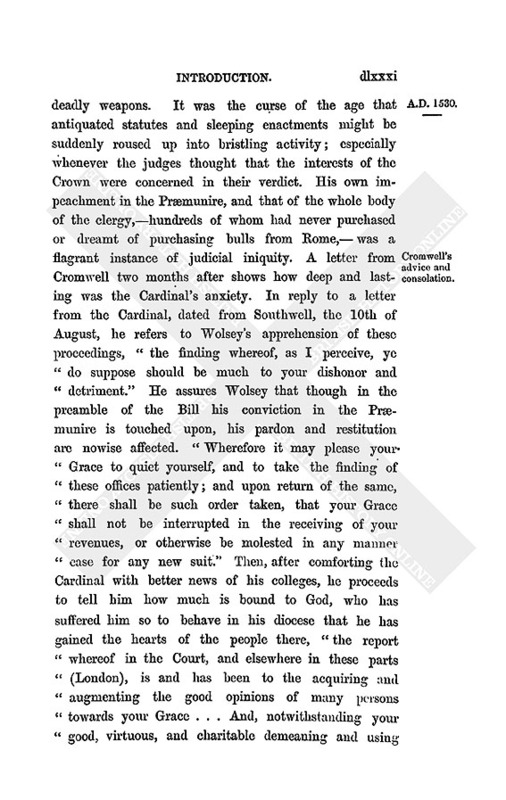 In a letter addressed, Aug. 4th, by Thomas Runcorn to Wolsey, who had been sent to London by the Cardinal, we learn the real state of the case. "I have spoken," he says, "to Master Secretary (Gardiner), and given him thanks for his faithful love to you ... beseeching him to persevere in his goodness, and declaring that, whatsoever was thought or spoken by other men, your Grace specially trusted in him above all men. I told him the great necessity your Grace was in, and begged him to solicit the King, out of respect to the service your Grace had done him, that he would, out of consideration for your former and present estate, look upon you with charity, and relieve you from this miserable poverty. I showed him that the 1,000 marks had for your journey to the North were spent in paying your debts previous to leaving London, and you had not more than 100l., so that you have been obliged to borrow for the support of yourself and your household; that as for the magnificent buildings you were accused of making, they are nothing but the stopping of holes where it rained in from the windows, doors, &c., and had been paid by your receiver at Southwell out of his own money. Nor I forgot not to remember how that he, and only he, was privy here, and with what trust you committed yourself and all you had to the King. I moved him touching your colleges, showing how much they stuck in your thoughts ... He answered that he was perfectly willing to accomplish whatever should be most to your interest and pleasure, but he had no such favor with the King that he might come to his speech at all times." p.2946. 58. 18 August, State Papers, I. 365. 59. 11 April, Capon to Wolsey, p. 2845. 60. 9 July, p. 2928. 62. Henry provided for the college at Windsor out of the estates of Wolsey's colleges. Among the grantees of Wolsey's estates are the names of the earl of Worcester, Sir Wm. Fitzwilliam, Sir Rich. Page, of the King's chamber, Sir Francis Bryan, Sir Anth. Ughtred, Sir Edw. Seymour, John Pen, George Colt, Thomas Baret, Thos. Pemberton, and others. See p. 2933. 63. 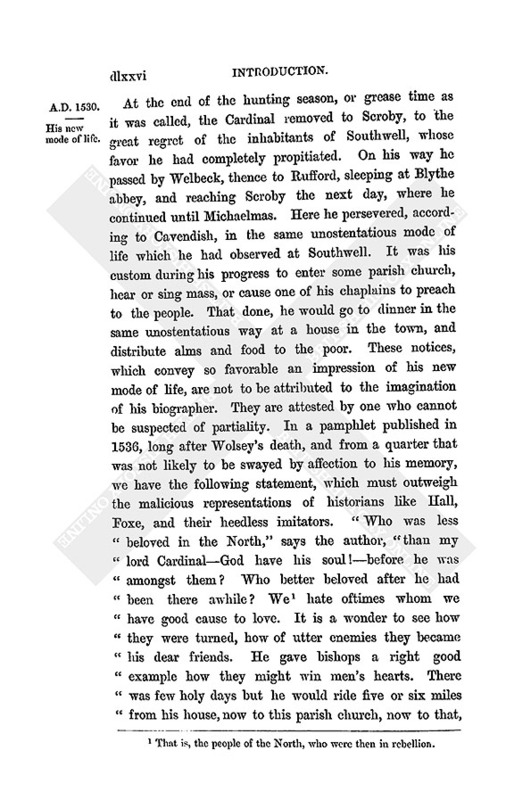 A curious account of the proceedings at Oxford on this occasion, by an eye-witness, will be found in a poem just published for the Roxburghe Club, entitled Grisild the Second, p. 75. It appears that Longland bishop of Lincoln was the chief commissioner on the King's side; but, as the writer asserts,— "There was used no indifferency. Such as by learning made against the King, They were redargued most cruelly, Threatened also to forgo their living. On th'other side all thereto inclining, They had high cheering, with meed other way; Falsehood triumphing, Truth quaking for fray."—p. 76. The students and inhabitants of the town were so highly incensed at these proceedings that at Lincoln College, where the Bishop lodged, they fastened the gates with ropes, and painted a gallows upon them. 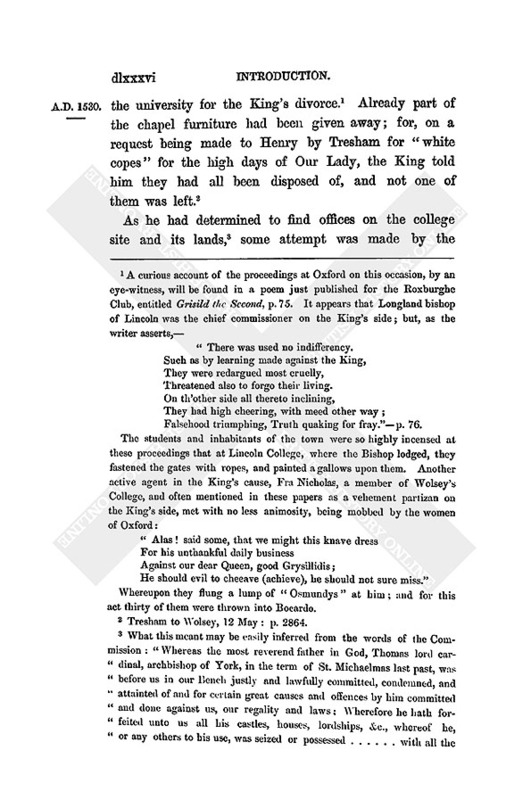 Another active agent in the King's cause, Fra Nicholas, a member of Wolsey's College, and often mentioned in these papers as a vehement partizan on the King's side, met with no less animosity, being mobbed by the women of Oxford: "Alas! said some, that we might this knave dress For his unthankful daily business Against our dear Queen, good Grysillidis; He should evil to cheeave (achieve), he should not sure miss." Whereupon they flung a lump of "Osmundys" at him; and for this act thirty of them were thrown into Bocardo. 64. Tresham to Wolsey, 12 May: p. 2864. 65. What this meant may be easily inferred from the words of the Commission: "Whereas the most reverend father in God, Thomas lord cardinal, archbishop of York, in the term of St. Michaelmas last past, was before us in our Bench justly and lawfully committed, condemned, and attained of and for certain great causes and offences by him committed and done against us, our regality and laws; Wherefore he hath forfeited unto us all his castles, houses, lordships, &c., whereof he, or any others to his use, was seized or possessed ... with all the profits and revenues of the same: And forasmuch as it is come to our knowledge that the said Cardinal hath not only enfeoffed the dean and canons of a college by him lately erected within our university of Oxford ... and because that by order of our laws offices must be found for us, comprising the certainty of the said lands; we, intending the effect of our said laws in that behalf to be enforced, have authorised you, by our Commission under our Great Seal, to enquire of the same," &c. Howard's letters, p. 157. 66. Higden to Wolsey, 22 August: p. 2963. 67. Tresham to Wolsey, 7 October: p. 3004. 68. A friend of Anne Boleyn. 70. p. 2936. See also his letter to Gardiner, p. 2938. 72. p. 2961. 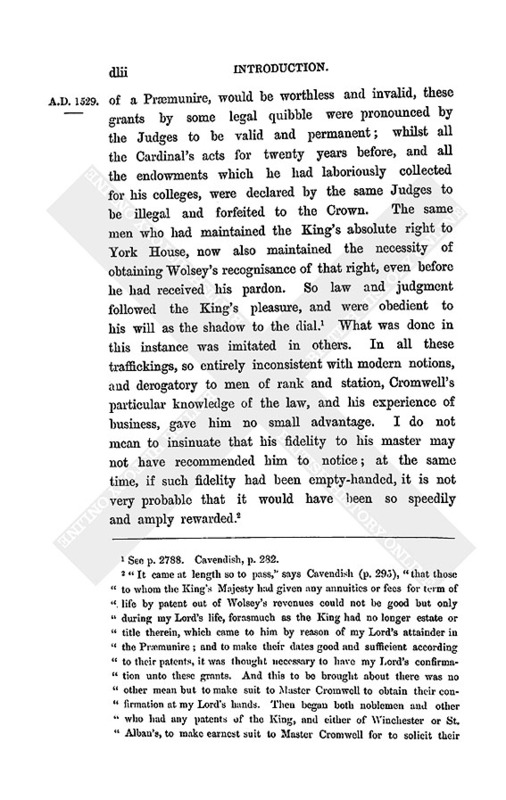 In his letter to the Lord Chief Justice on the same subject he says that as he had never intended to use his legatine authority to the derogation of the King's dignity, it would be great pity "that to these poor innocents (his scholars) the sharpness and rigour of the law should be ministered." He adds, that in the erection and foundation of the college he had been guided by the advice of all the Judges. 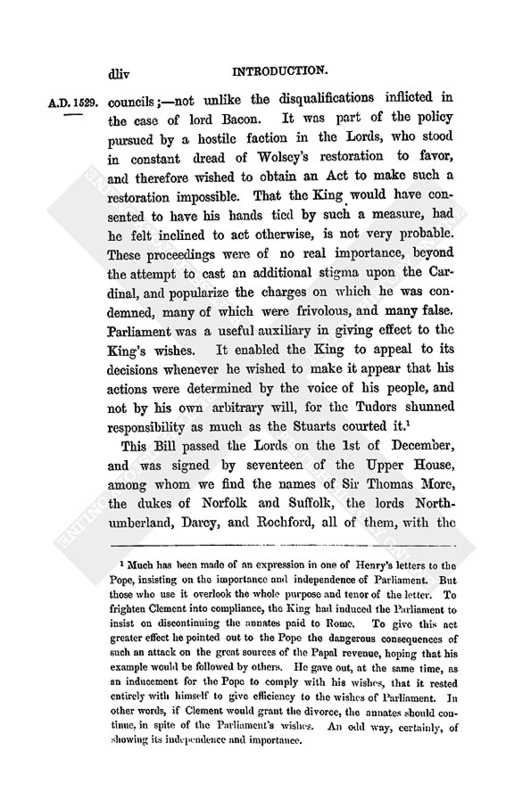 It is quite clear that the Act of Præmunire was never intended to be interpreted as it was in Wolsey's case, where the legatine authority was used on behalf of the Crown, and with its full consent, and not against the Crown. In another letter he states that the college had been erected by the grants of the King and the Pope as effectually as could be devised. If, therefore, it was an offence against the laws, it is one of which the King and the Judges were no less guilty than himself. 76. De Vaux himself, although employed by the French king, was a subtle Italian. 77. p. 2861. The treachery of this rascal is placed beyond dispute. 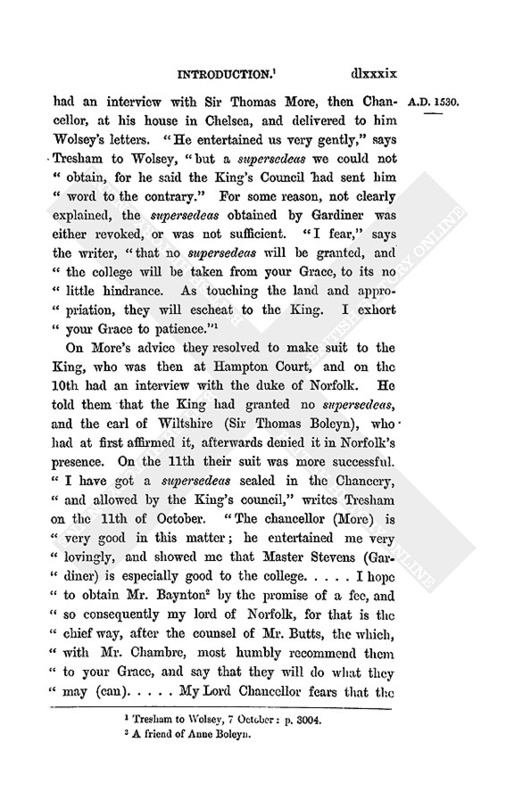 He was bribed and bought by Norfolk for 100l. His bond consenting to forfeit that amount, i.e. 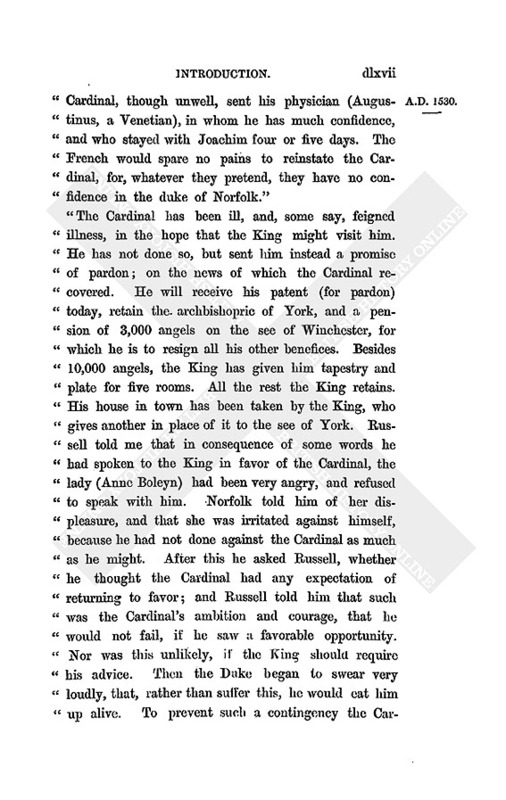 return it, in the event of not keeping secret "all such matter as is mentioned in a book, written with his own hand, concerning the late Cardinal," and presented to Norfolk, will be found at p. 3057. 79. This also was an invention. There was no such confession. 80. Neither Francis nor Bryan knowing what it was ! 81. State Papers, VII. 211 (abridged). 82. This was one of the unfounded rumors industriously circulated at the time. 83. Whether he alluded to De Vaux, or to one of Wolsey's chaplains, who seems to have been implicated in his betrayal, is not clear. 84. Nov. 27: p. 3035. With this the reader may compare the account given by the Mantuan ambassador, Scarpinello, who was then in London. "After cardinal Wolsey's departure, by the King's order, to visit the church of York, which he had never done previously, by reason of his public occupations, he made his entry into that city with upwards of eight hundred horse (a mistake, as the Cardinal had not yet visited York), but by the doom of fortune he was made prisoner a few days ago, and taken by the earl of Northumberland, then delivered to the earl of Shrewsbury, by whom he will be brought to the Tower today or tomorrow. I have been unable to obtain any authentic account of the cause of this arrest. Some say that the Cardinal purposed to make his escape; some, that he advised the Pope to interfere in his favor, and in that of the English clergy, contrary to the statutes. Others attribute everything to the envy and fear of his rivals, who have repented of letting him fall on a feather bed, and are afraid lest he should rise again, and therefore are determined to despatch him. Up to this time, the Cardinal's physician, a Venetian, Messer Augustino, and a chaplain, have been arrested. The latter was on his way to cross the channel with certain letters, which are understood to have been of no great importance. As yet no harshness has been used in the examination of the said two persons." Ven. Cal. p. 262.